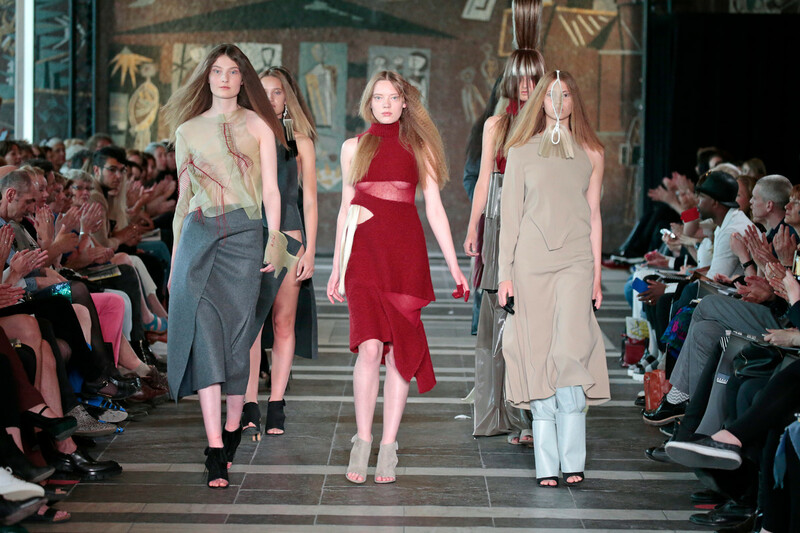 The graduation-season has officially started with the show of the University of the Arts in Arnhem, ArtEZ. 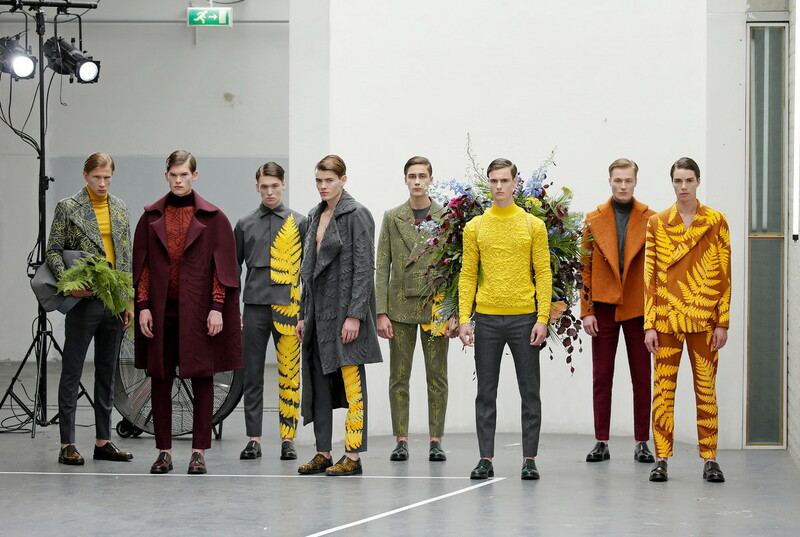 A big collection this year, colorful. 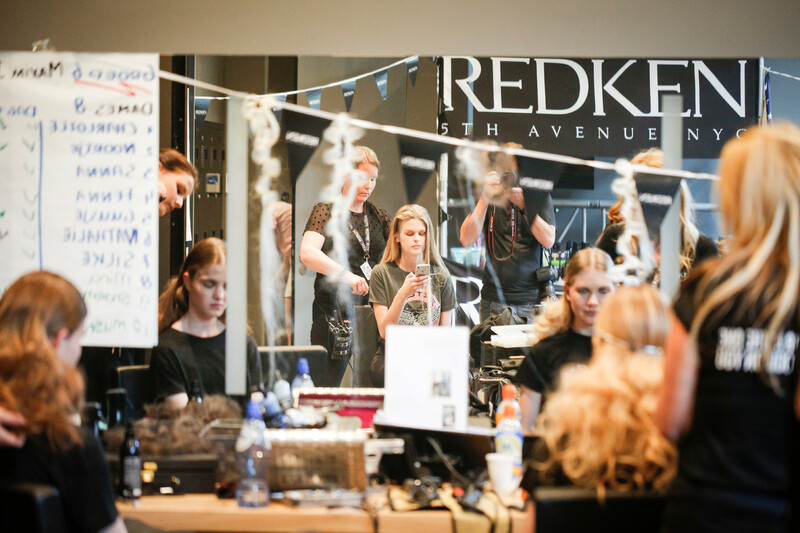 glamorous, dark, playful and made with lots of dedication. 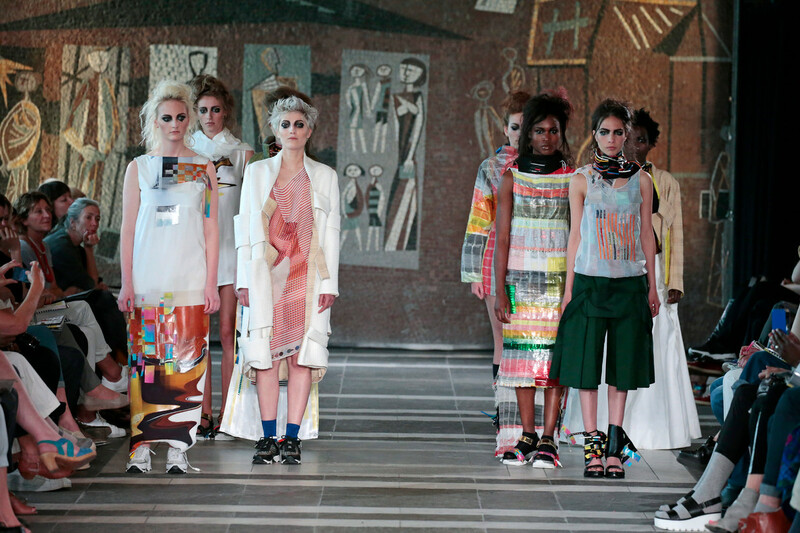 And the location was beyond your imagination, the renewed Musisacrum in the centre of Arnhem. 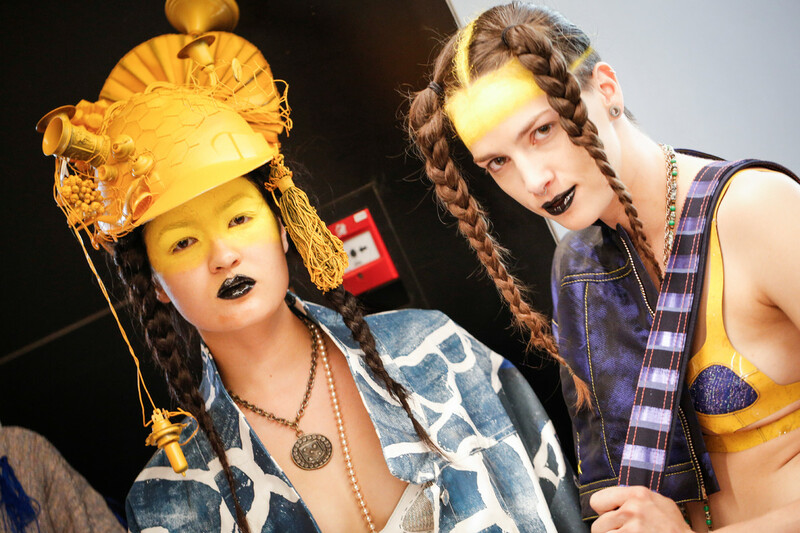 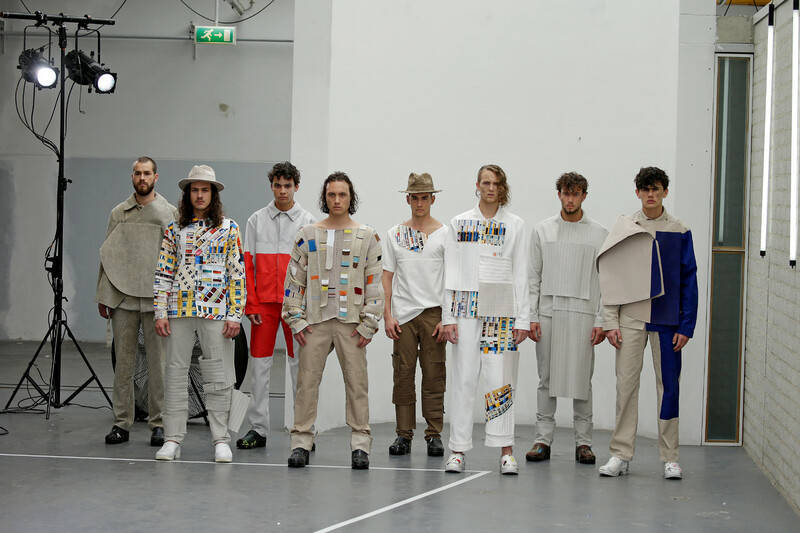 Paris is for many young fashion-designers still the place to be during the international fashionweek. 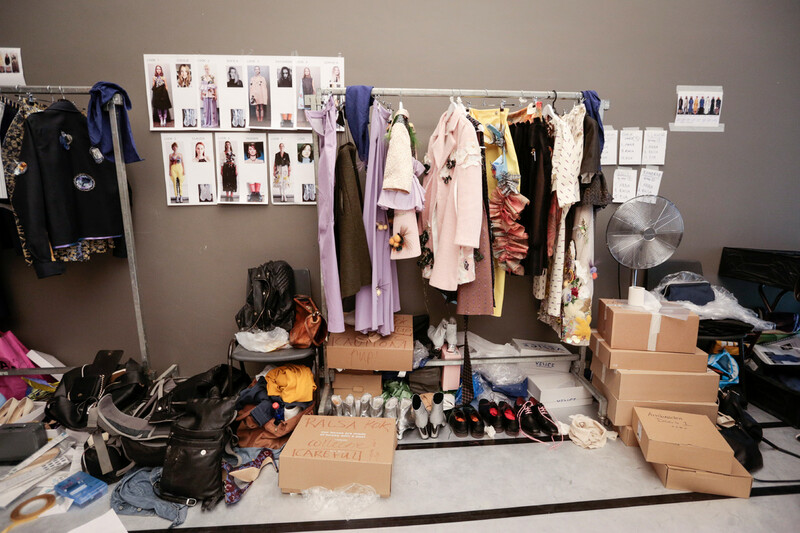 They hope editors and stylists find a little hole in their schedule and visit their showroom and presentation. 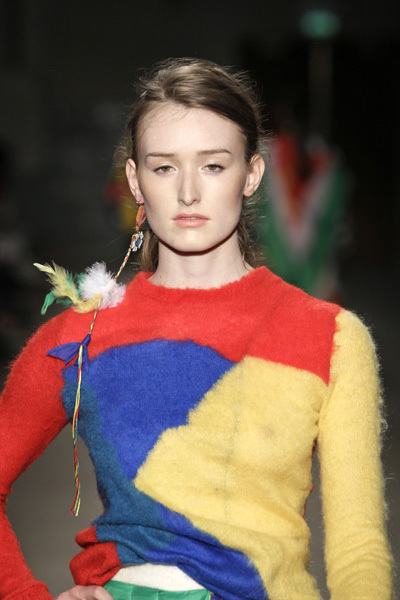 Well, it was certainly worth visiting Esther Dorhout Mees at the Totem showroom at 6, avenue Delcassé in Paris. 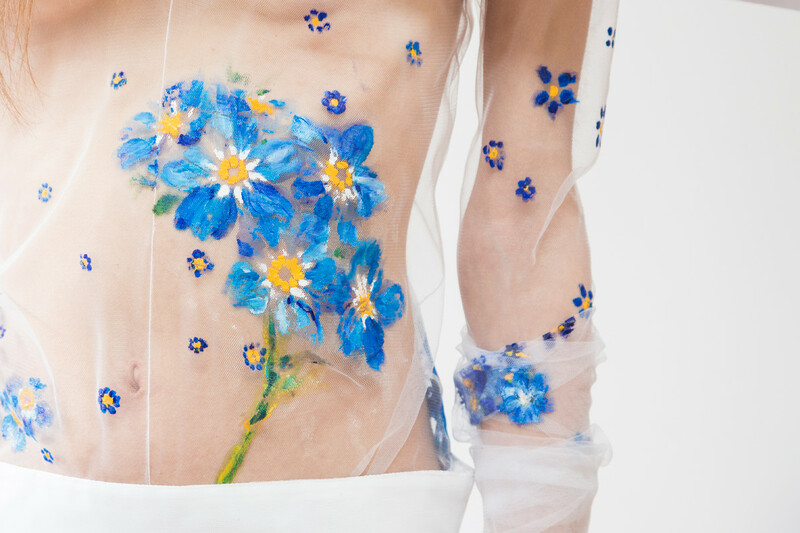 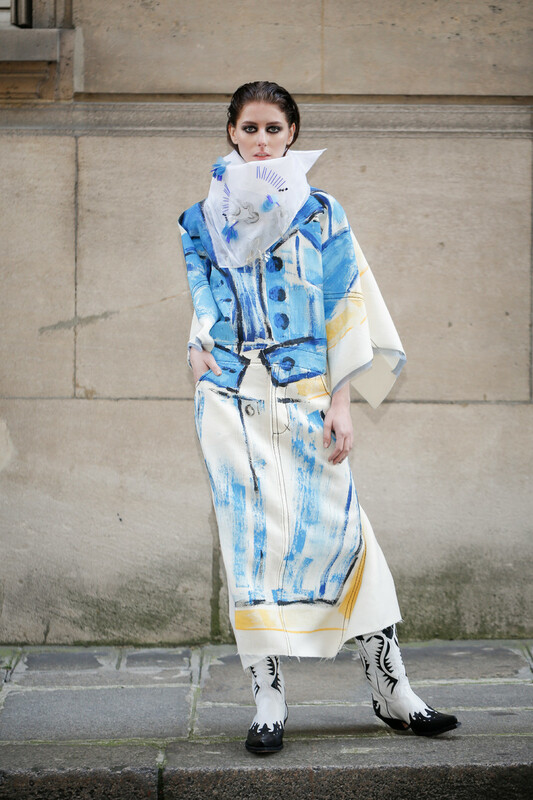 Her feminine and conceptual style is still there, this time reminding of a aquarel painting. 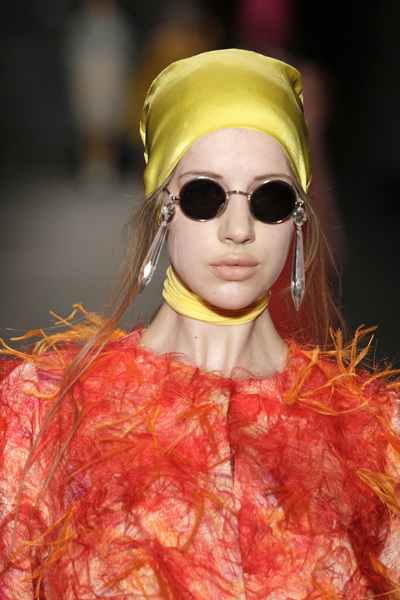 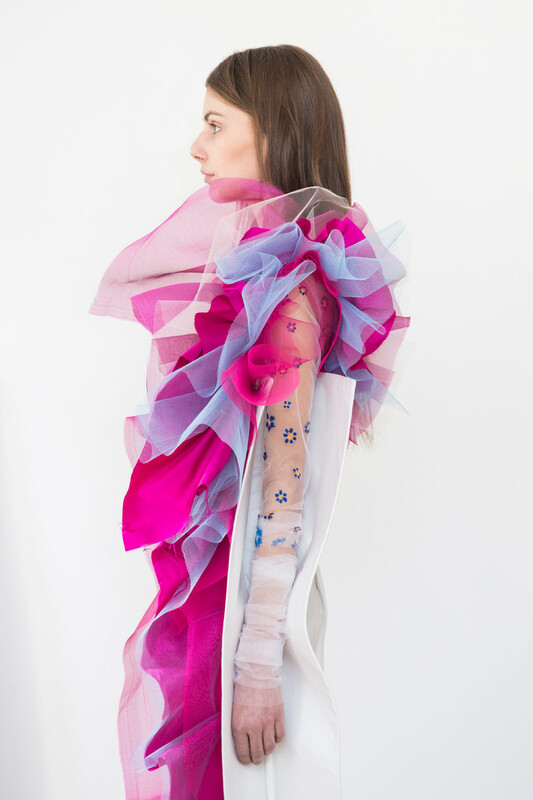 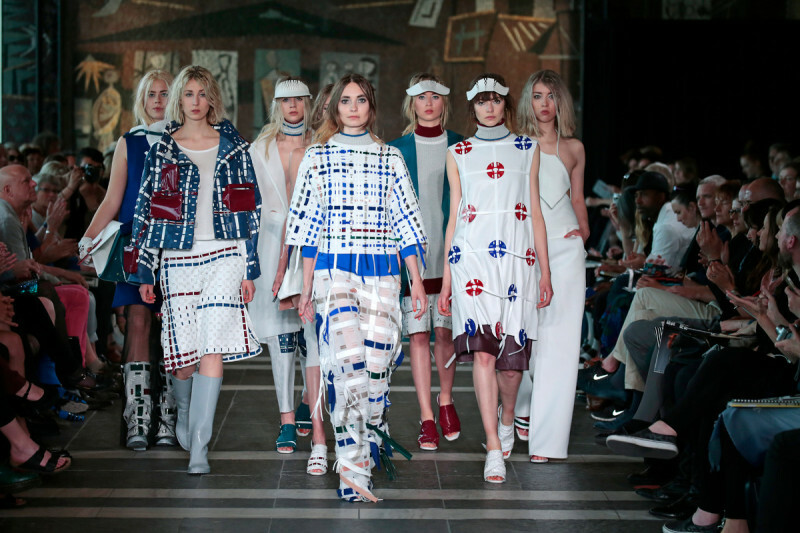 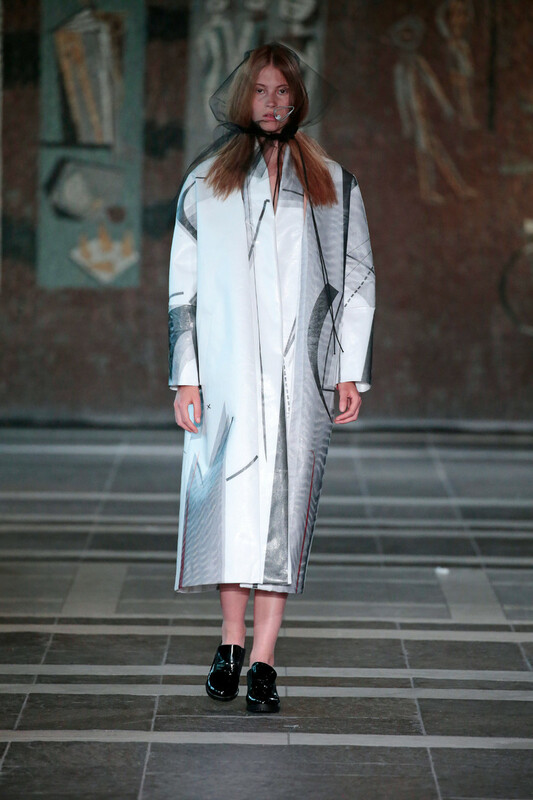 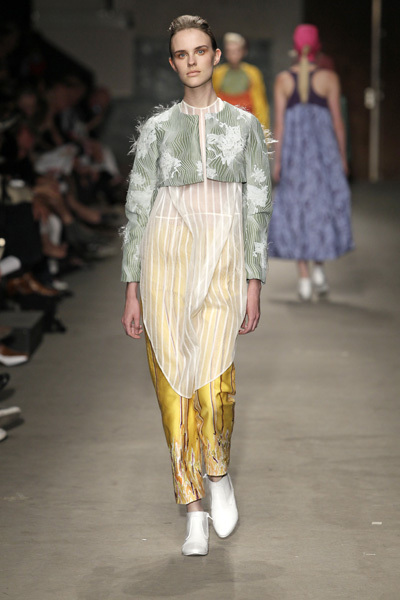 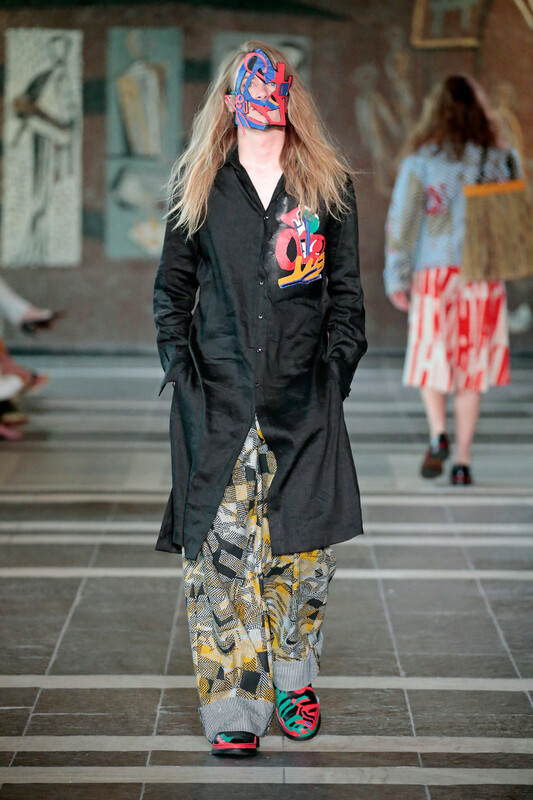 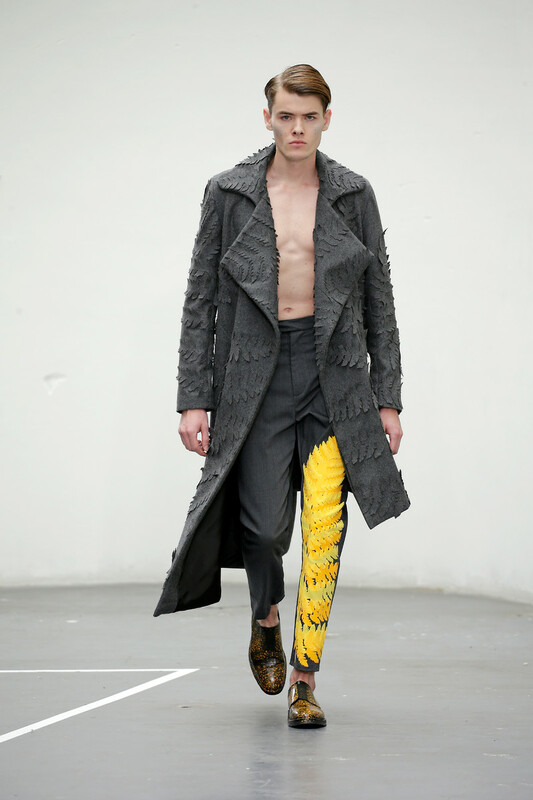 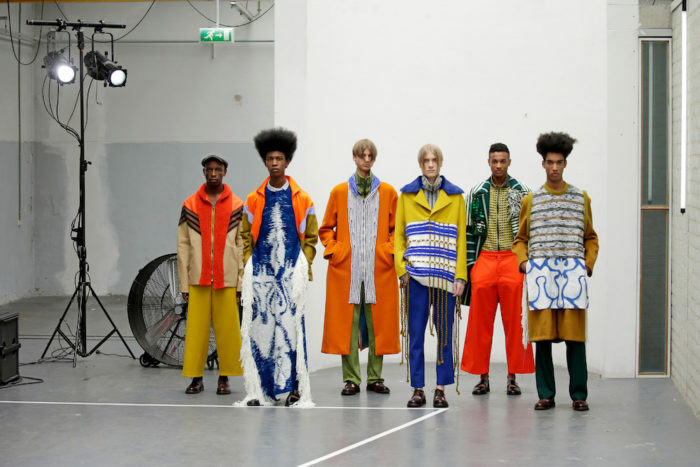 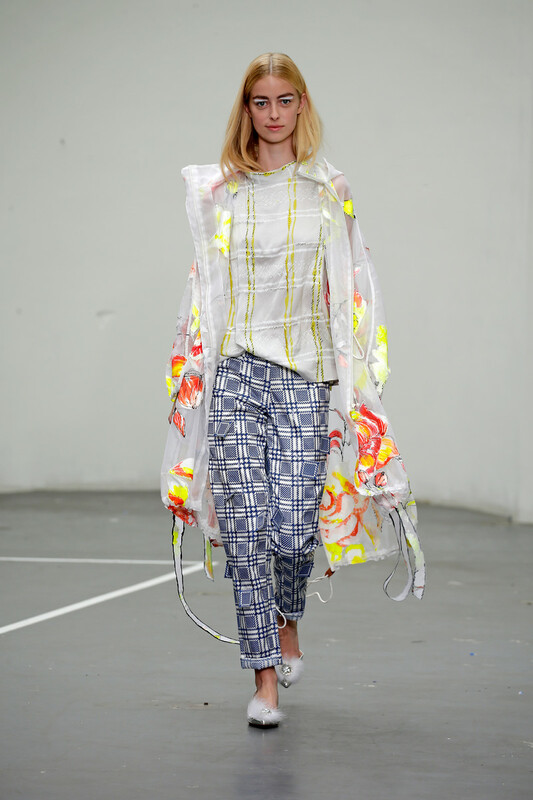 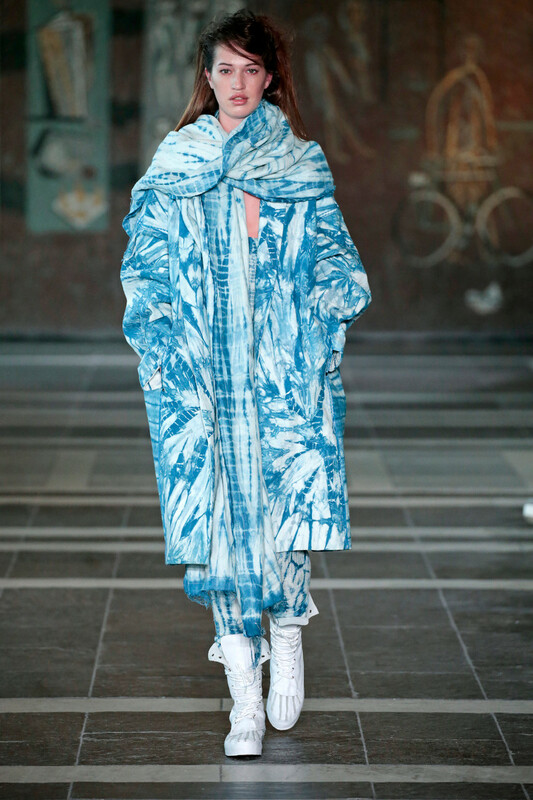 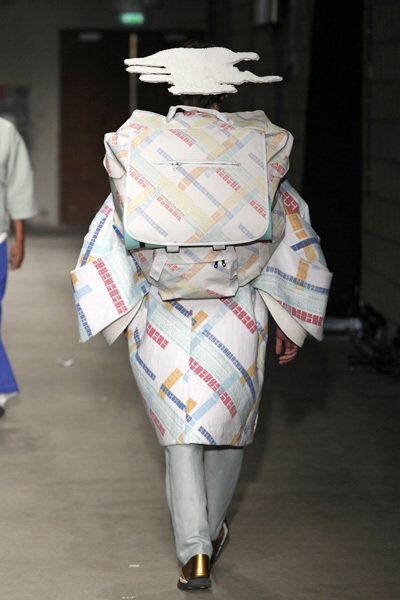 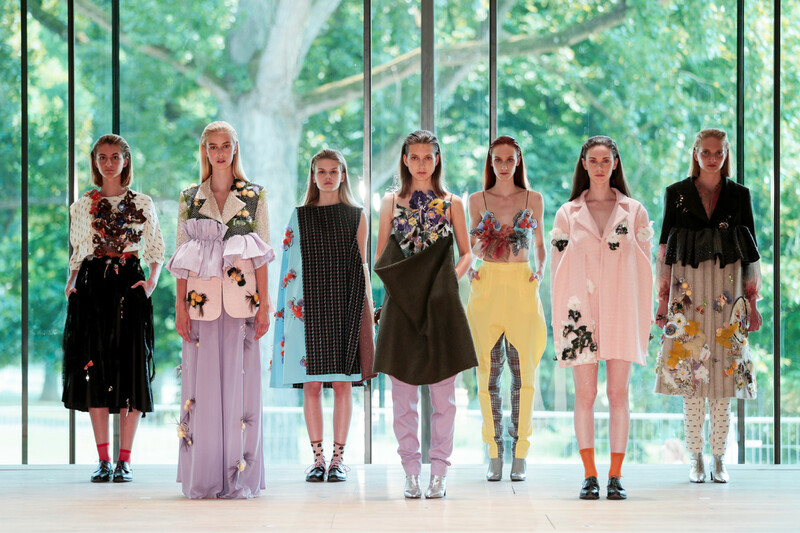 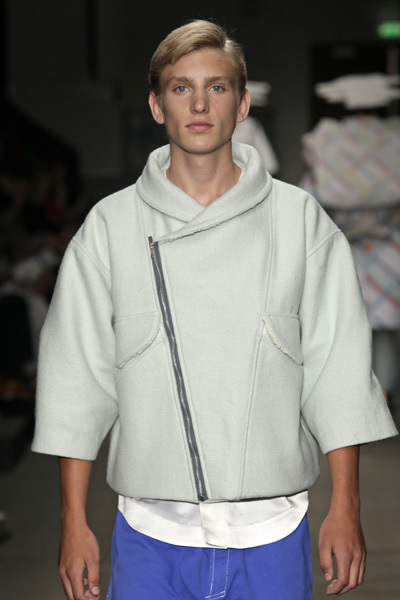 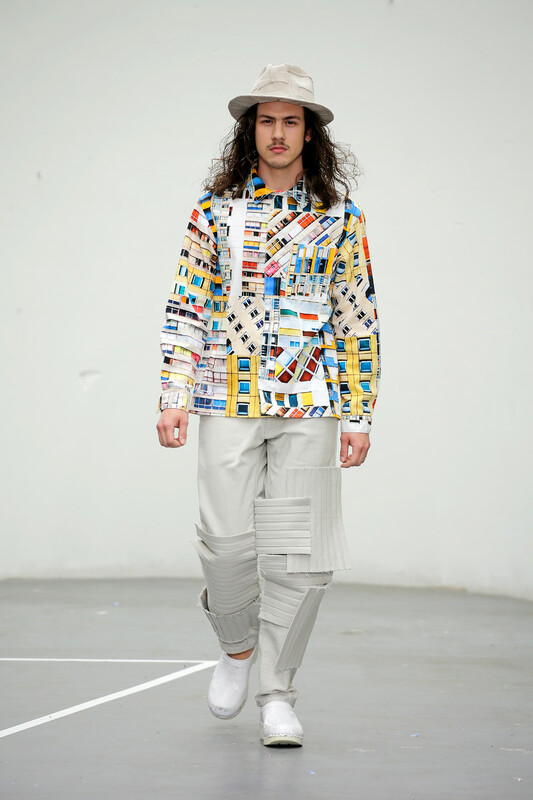 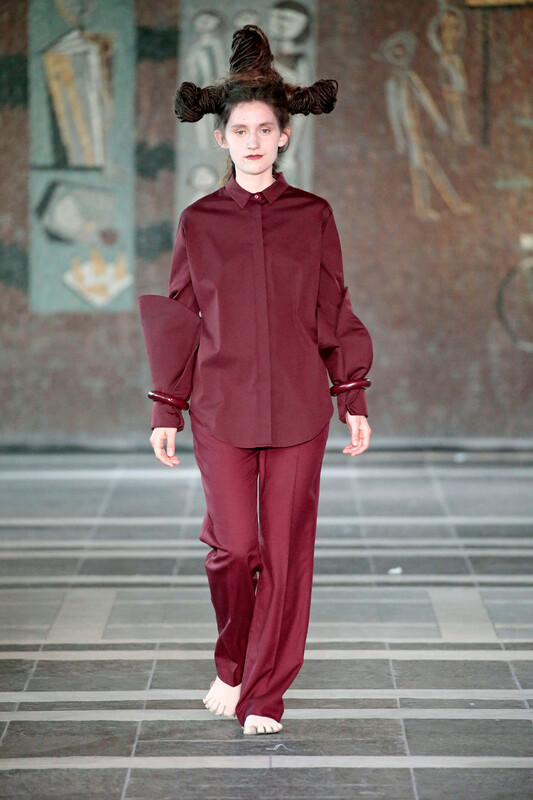 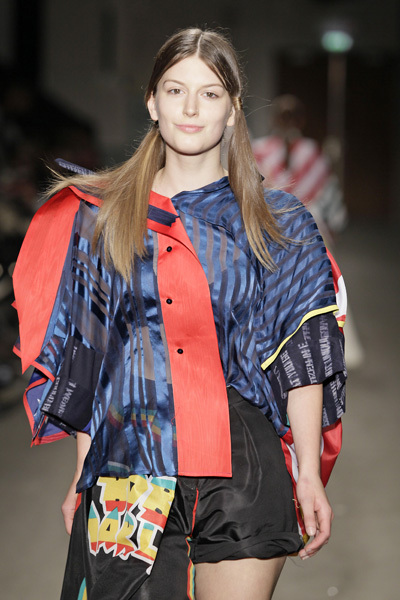 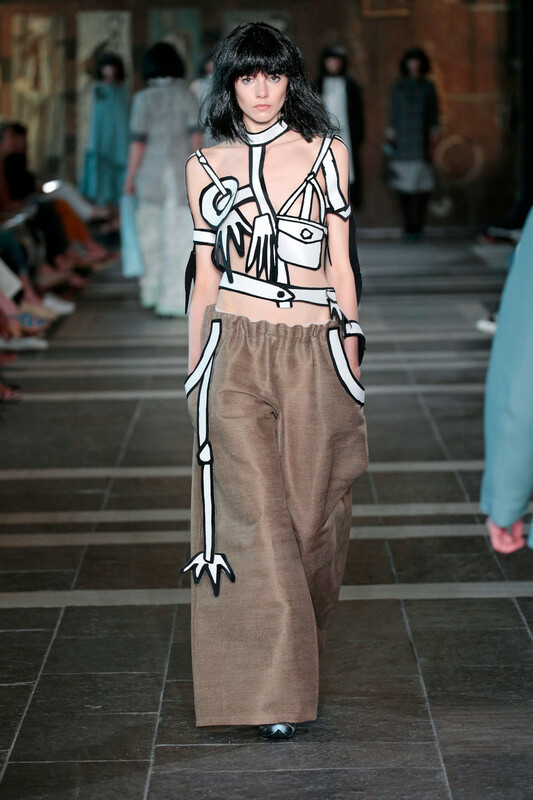 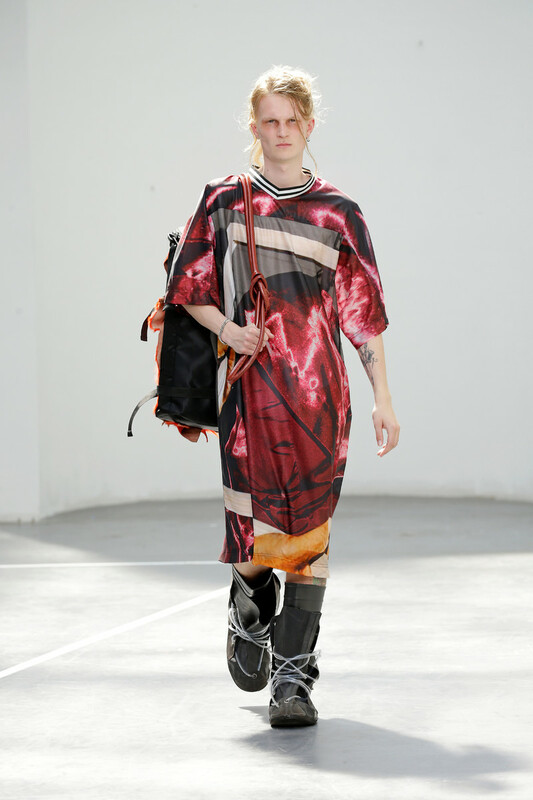 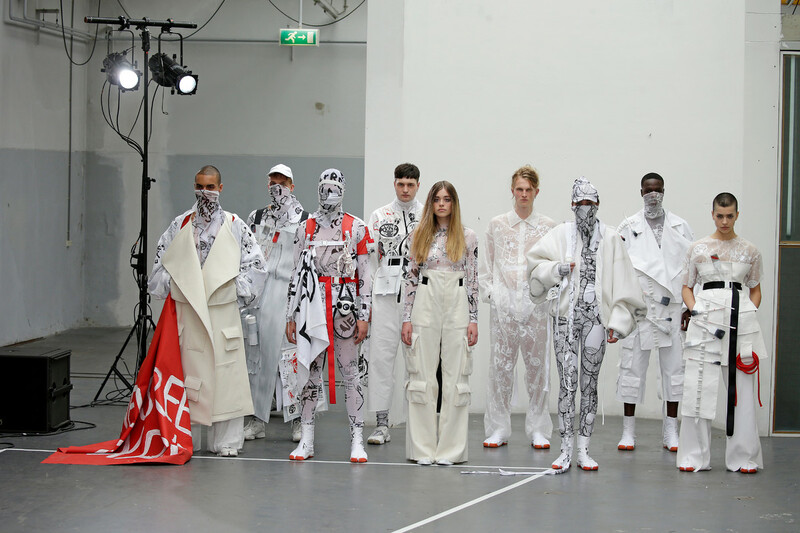 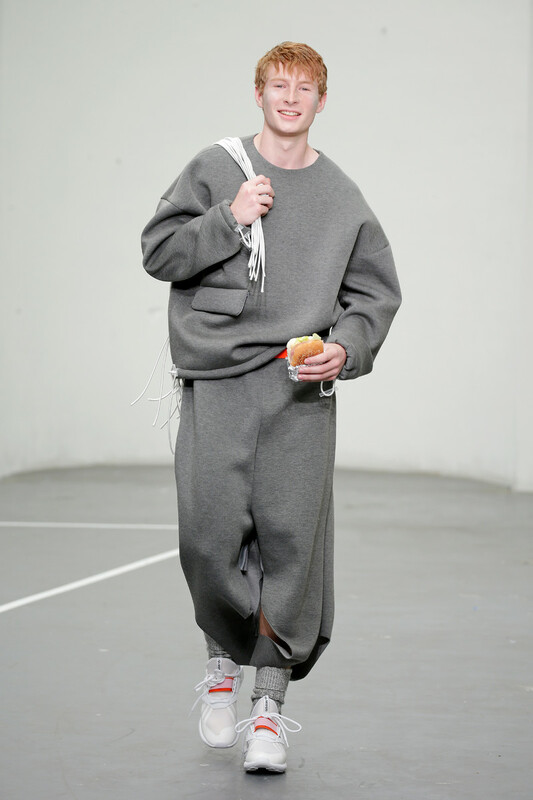 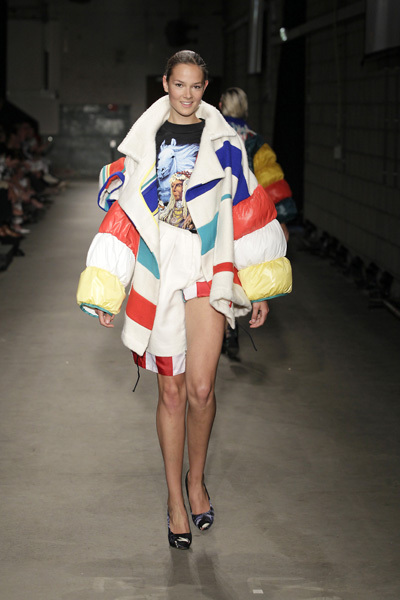 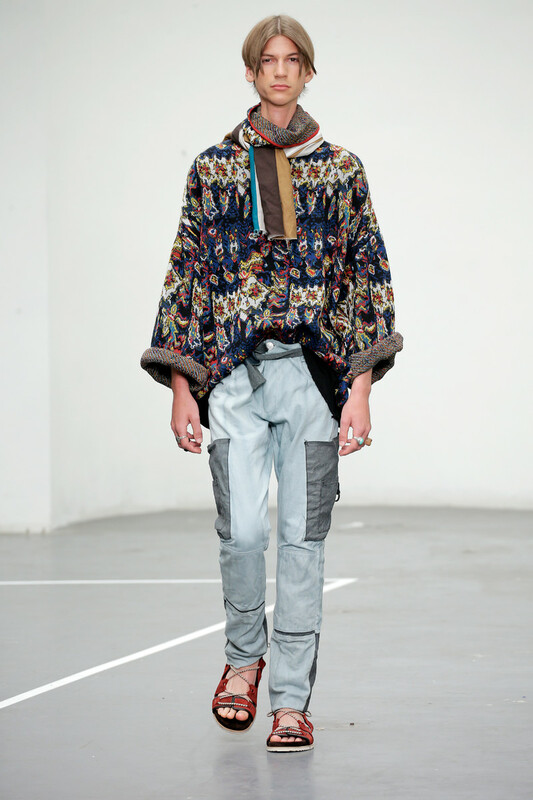 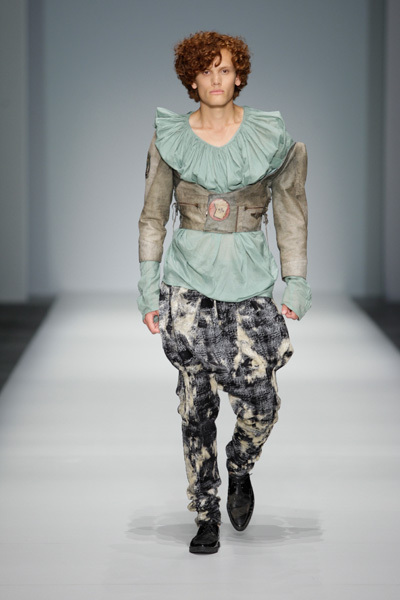 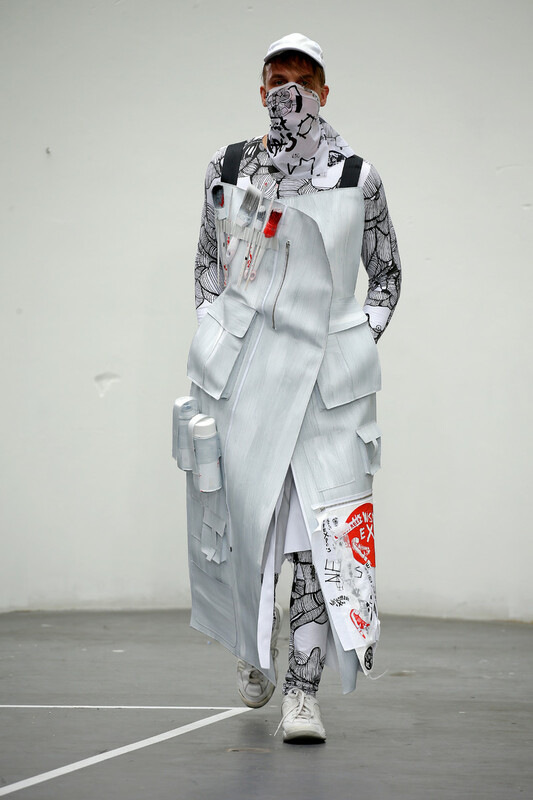 Two other designers who presented their latest designs were Lotte van Dijk and Klaudia Stavevra,the 18th generation of the fashion design master of ArtEZ University of the Arts Arnhem. 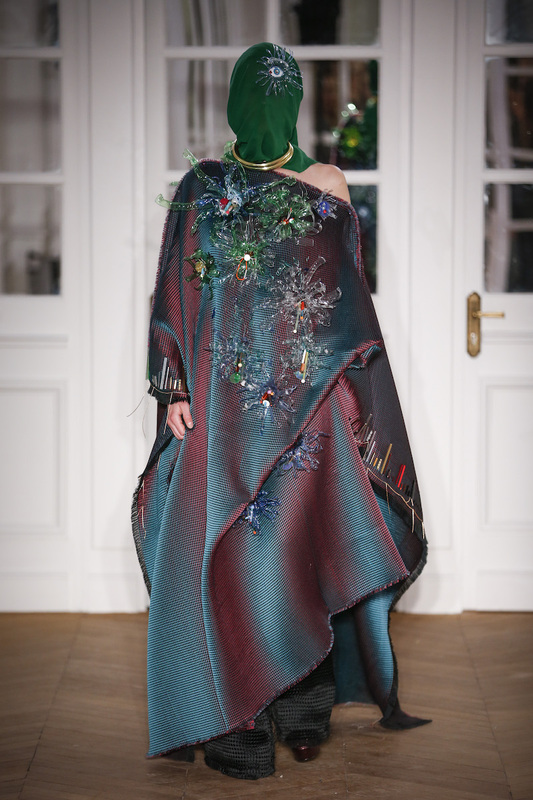 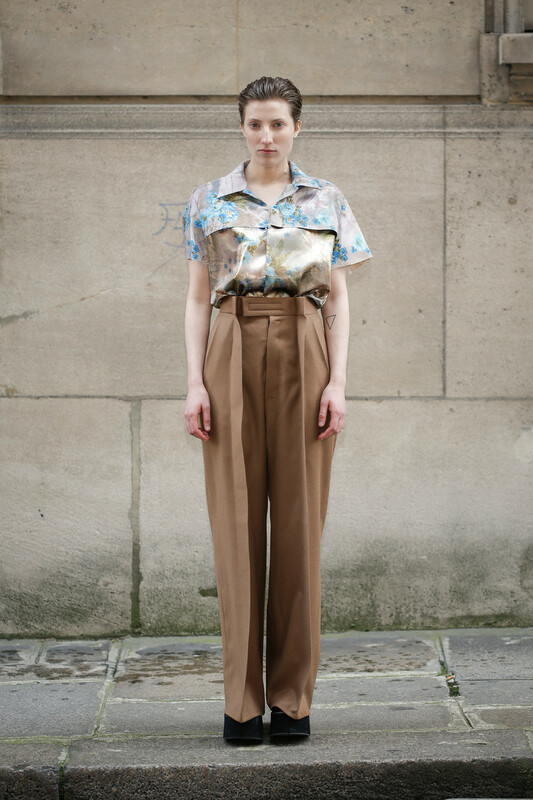 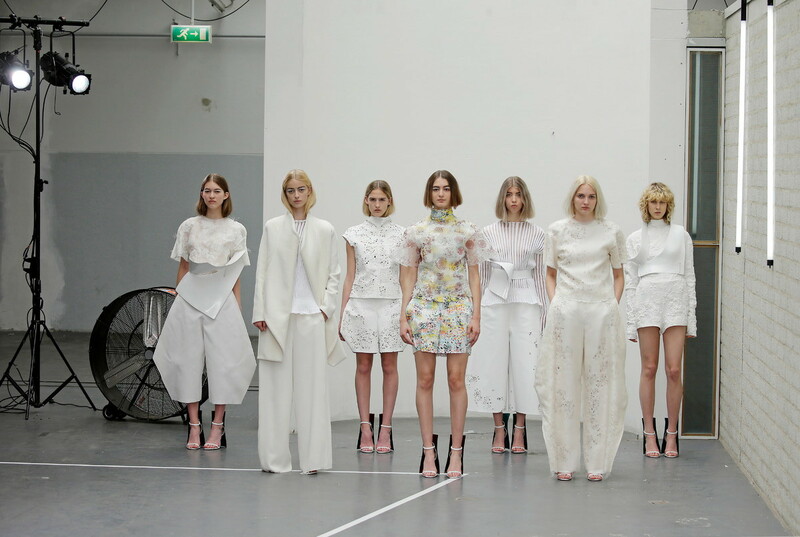 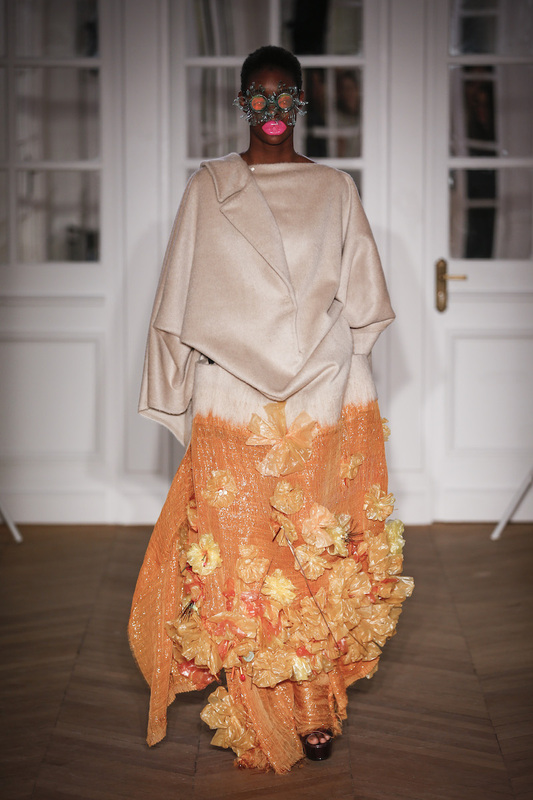 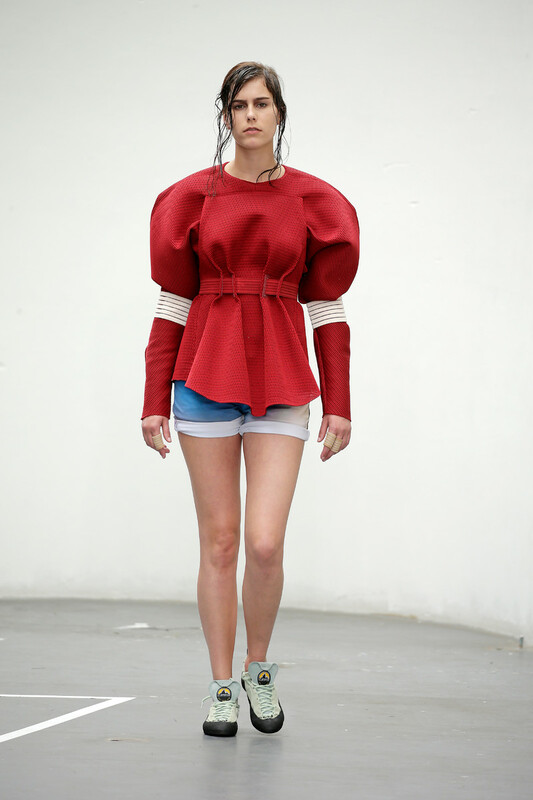 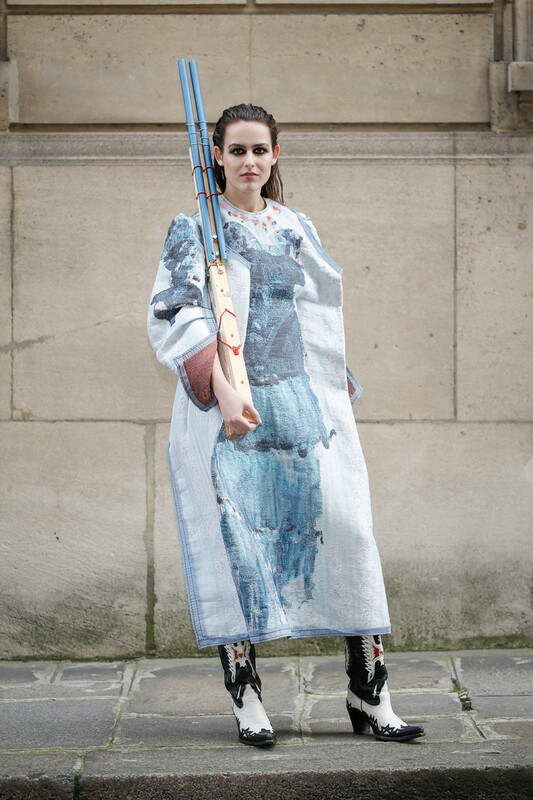 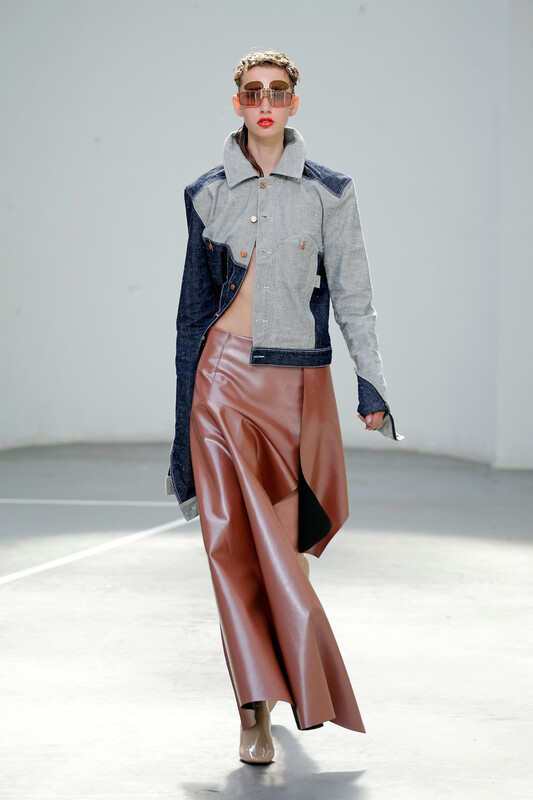 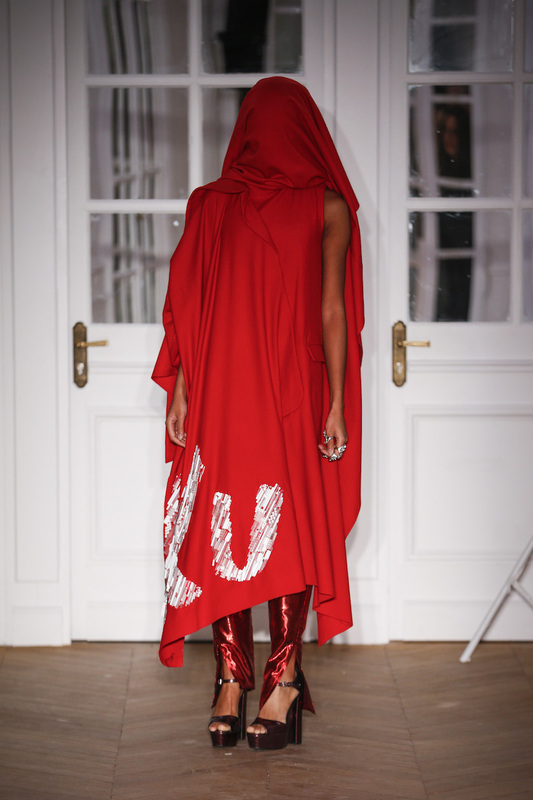 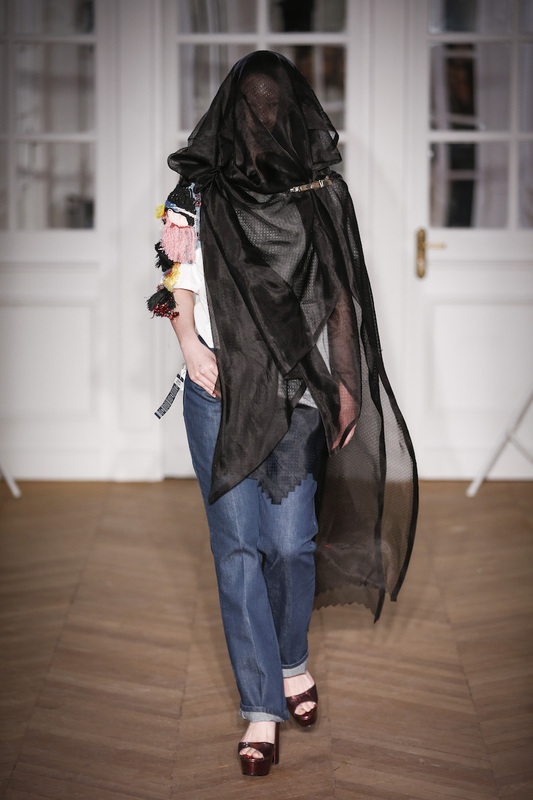 At Atelier Néerlandais they showed their highly personal visions on the future of fashion and femininity. 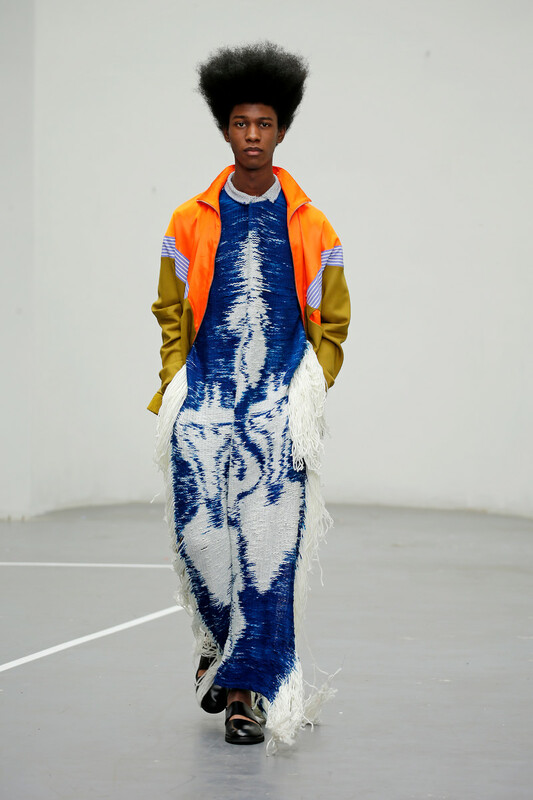 bold silhouettes, painted on top of the final garments or translated into jacquards. 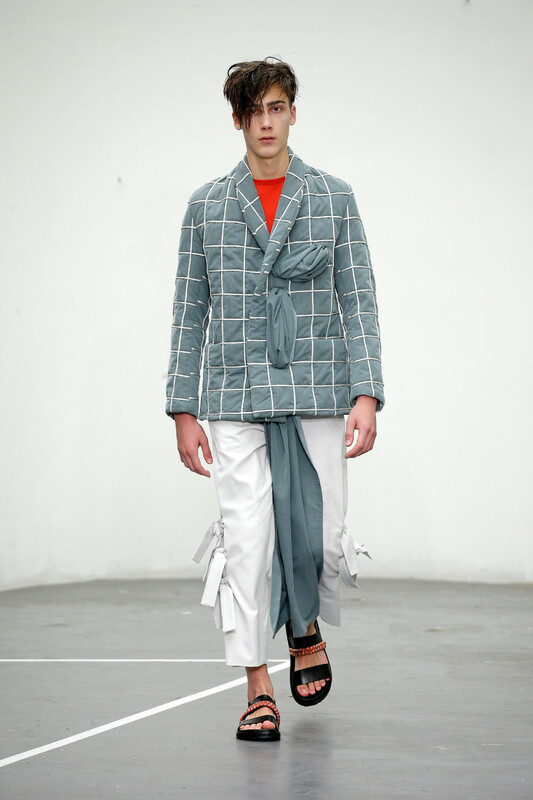 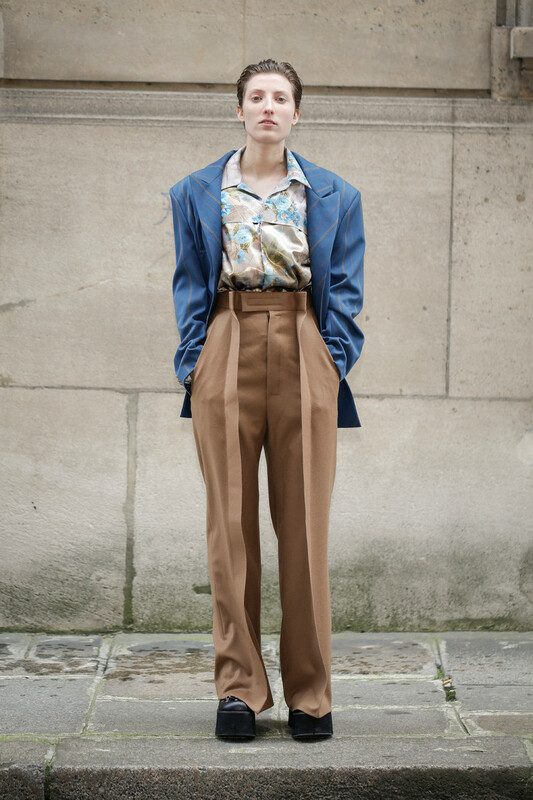 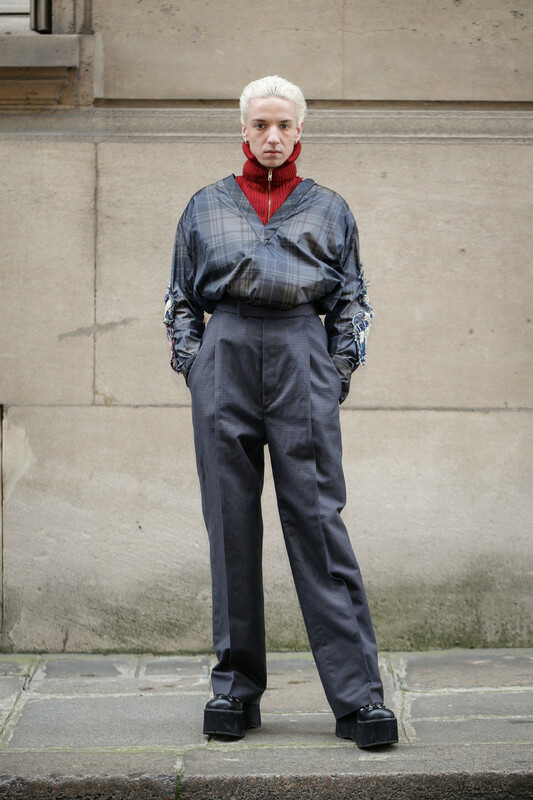 Oversized, easy shapes in combinations of jacquards with plastic, canvas or tarpaulin are manipulated by belts, gathering towards the body, or by folding the big darts outside. 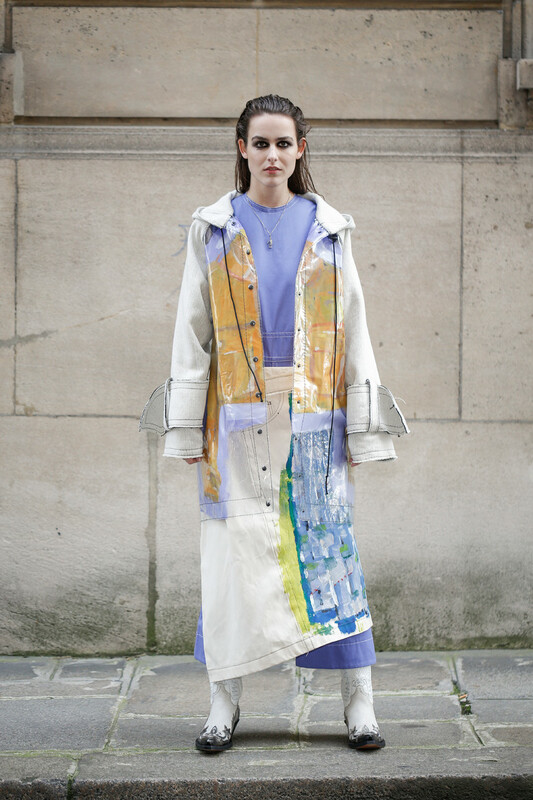 Lotte is nominated for Hyeres 2017. 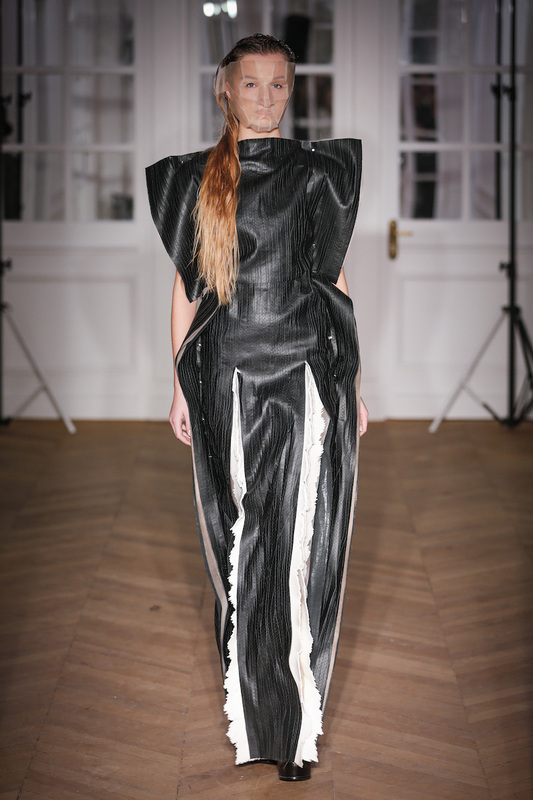 Klaudia Stavreva (Macedonia) presented her collection BOSSTVRVA. 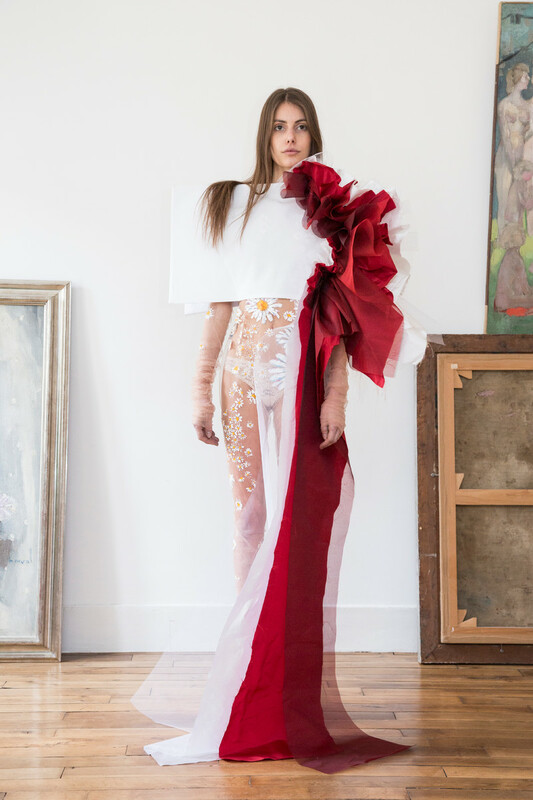 Inspired by the Sworn Virgins of Albania – women who assume the life and rights of a man, vowing not to marry or have children – she proposed a new, inverted way of power dressing – both sensual and strong. 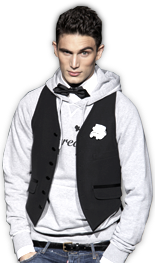 Modified garments, shapes and embellishments reference classic menswear, work wear, military dress, and Macedonian folkloric dress. 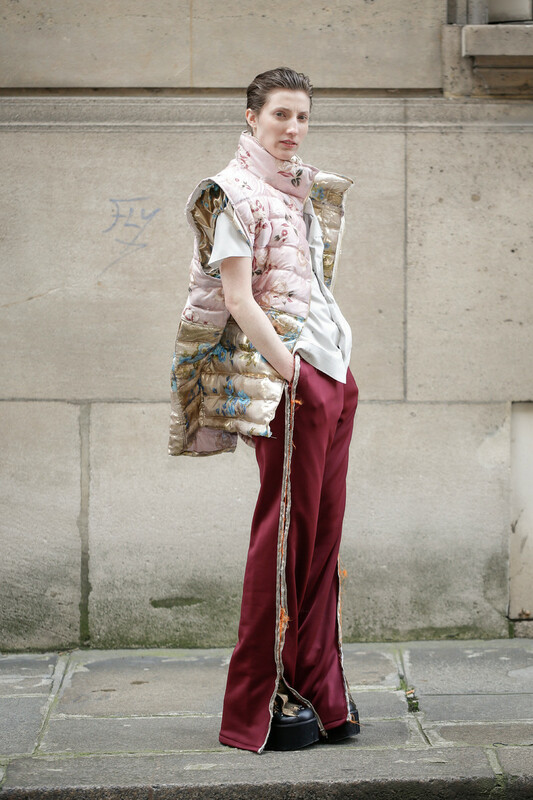 Luxurious detailing, embellishment and fabrics clash beautifully with the hard signature menswear references. 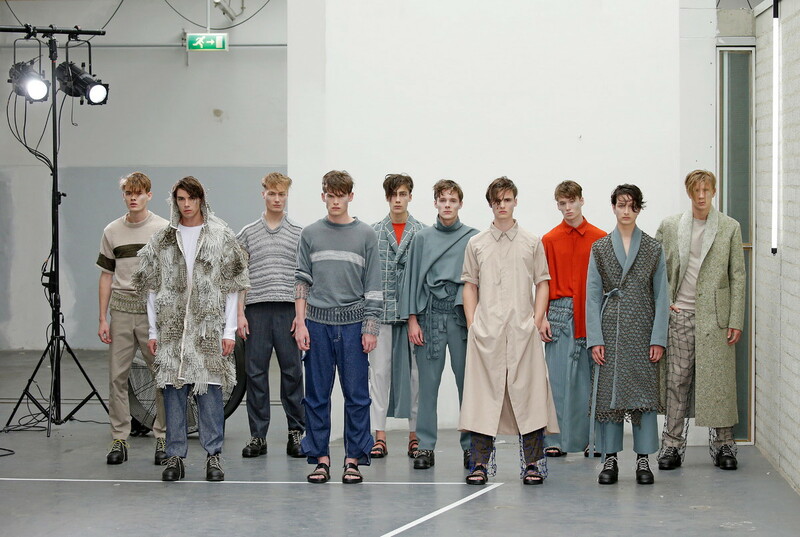 It’s time for Graduation-shows again. 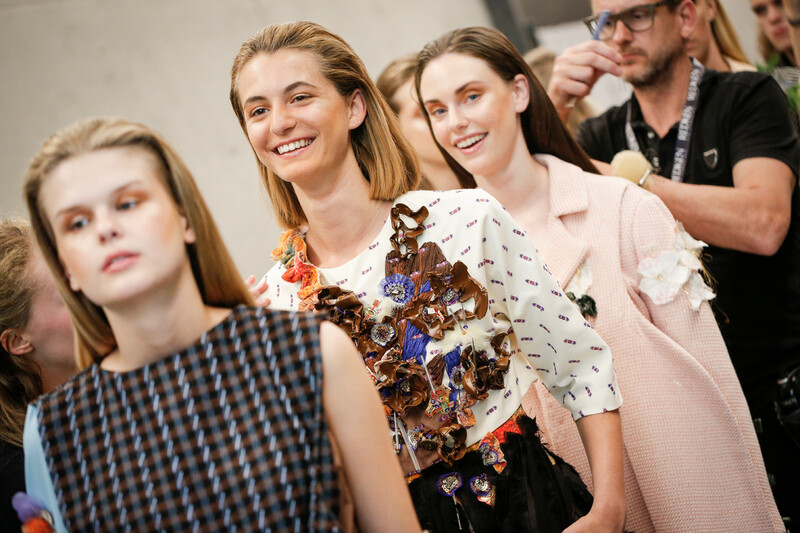 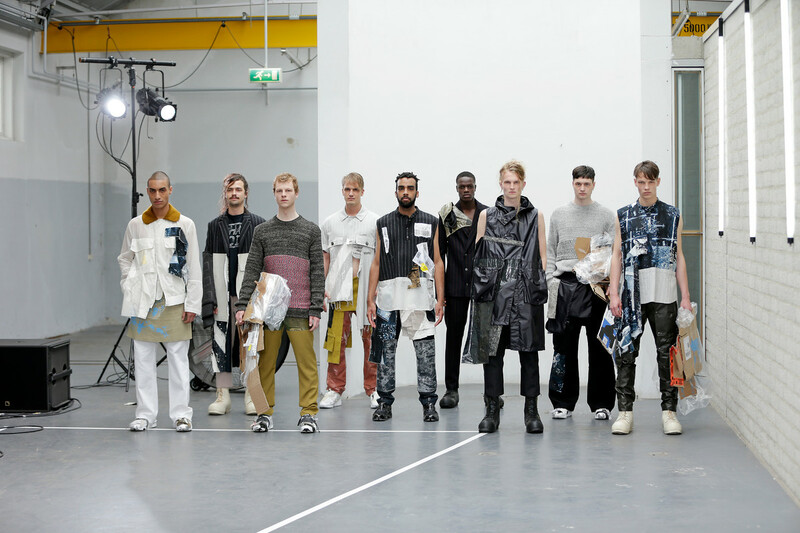 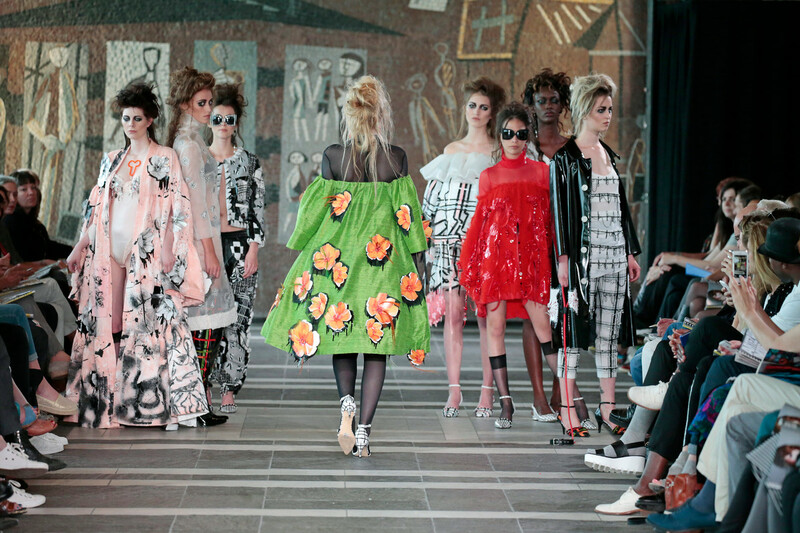 The fashion department of Academy of Fine Arts in Arnhem (ArtEZ) kicked off with a big show, followed later this month by others. 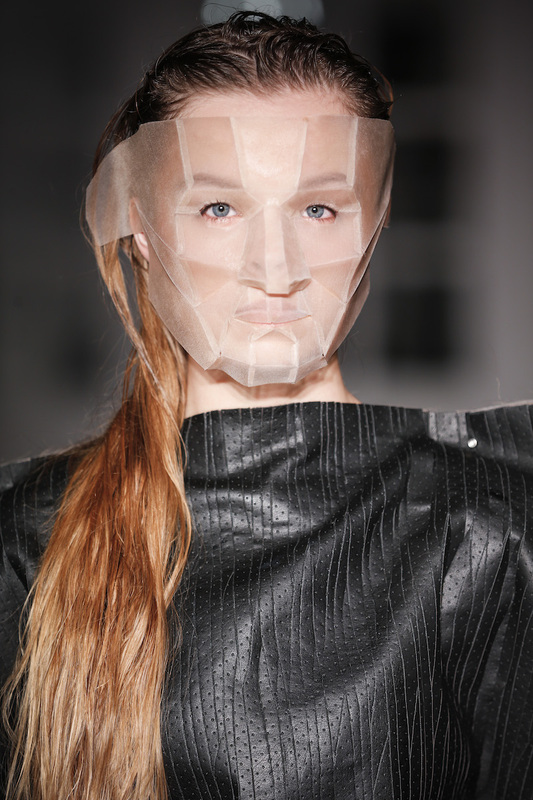 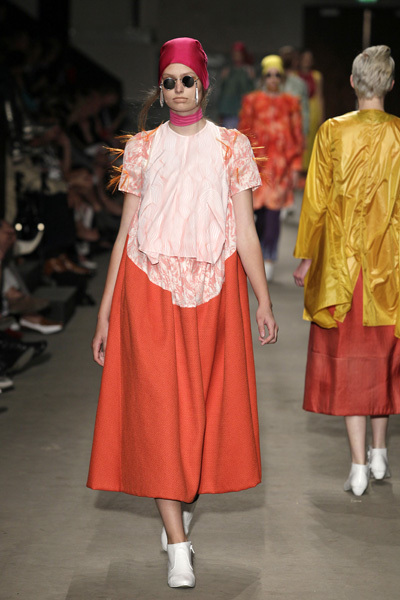 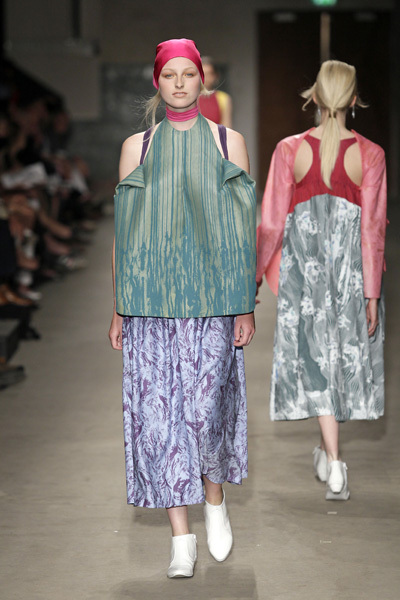 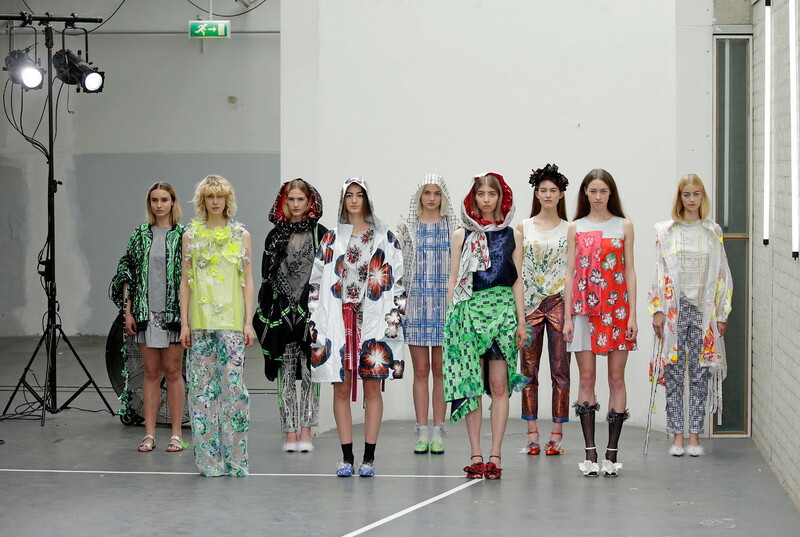 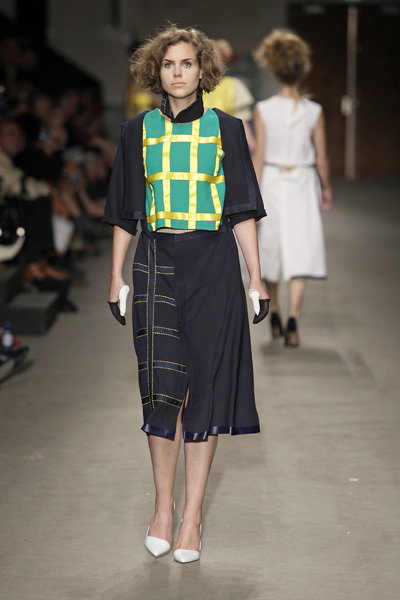 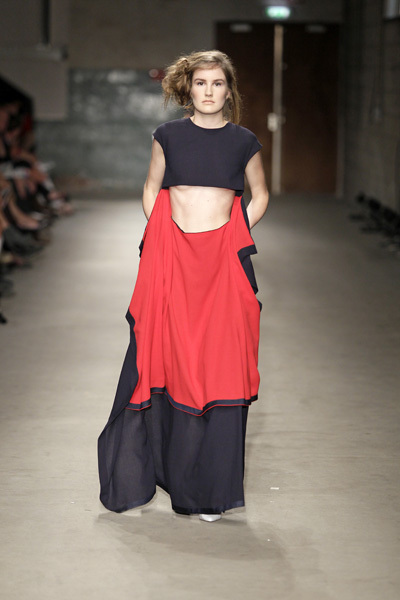 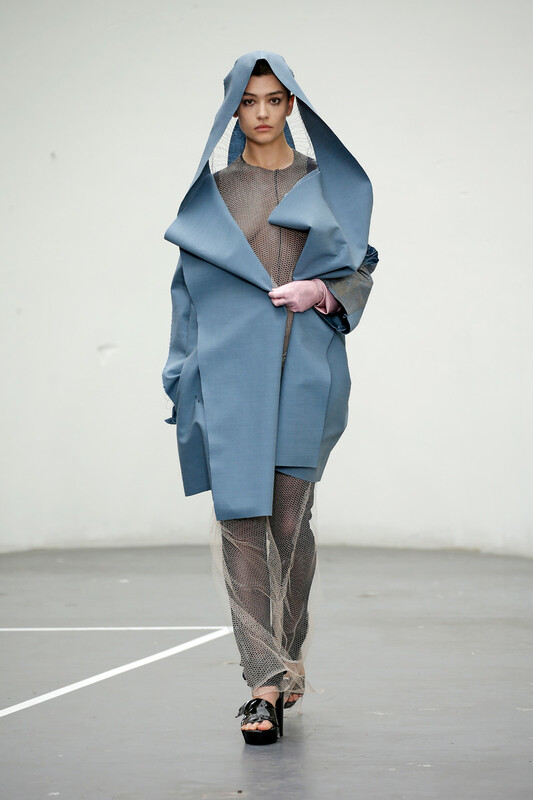 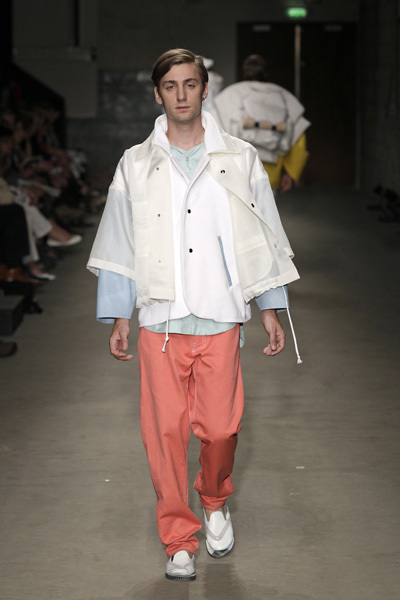 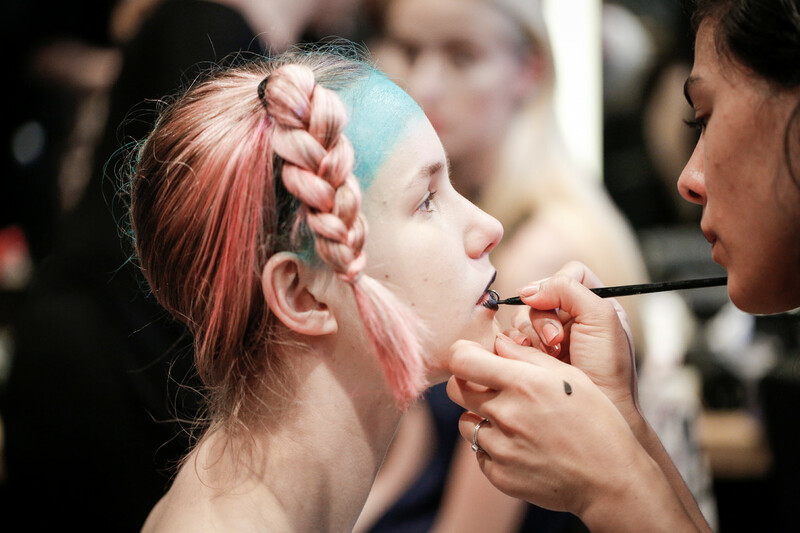 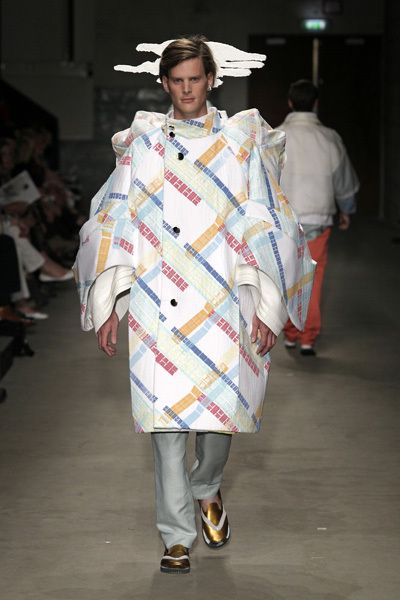 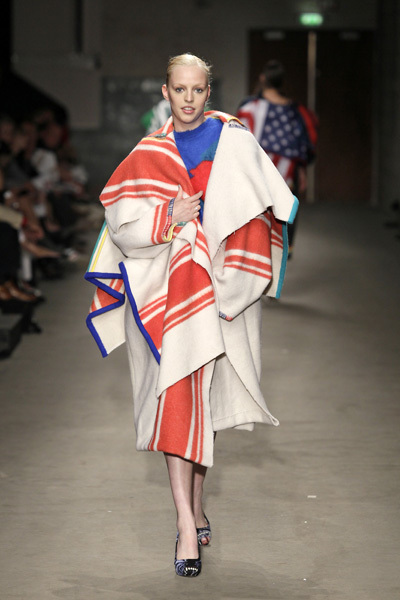 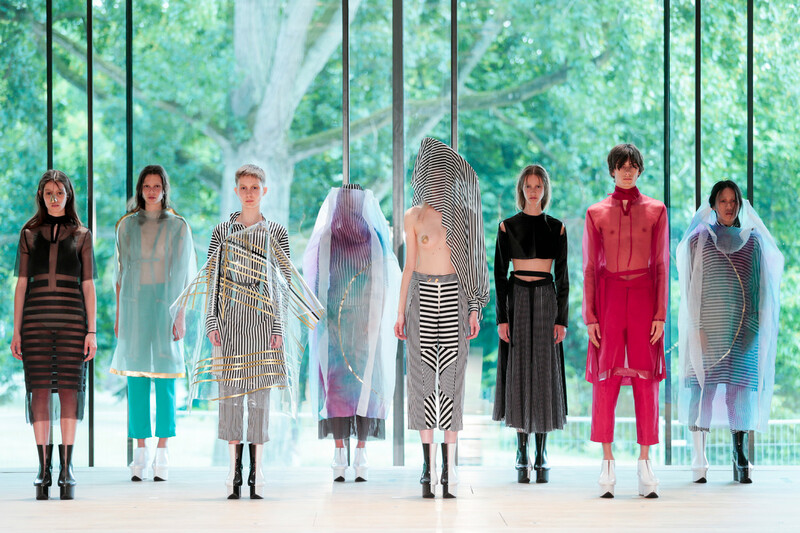 This year 24 students graduated at the Academy in Arnhem, and they presented their collection in the Elektrum in Arnhem. 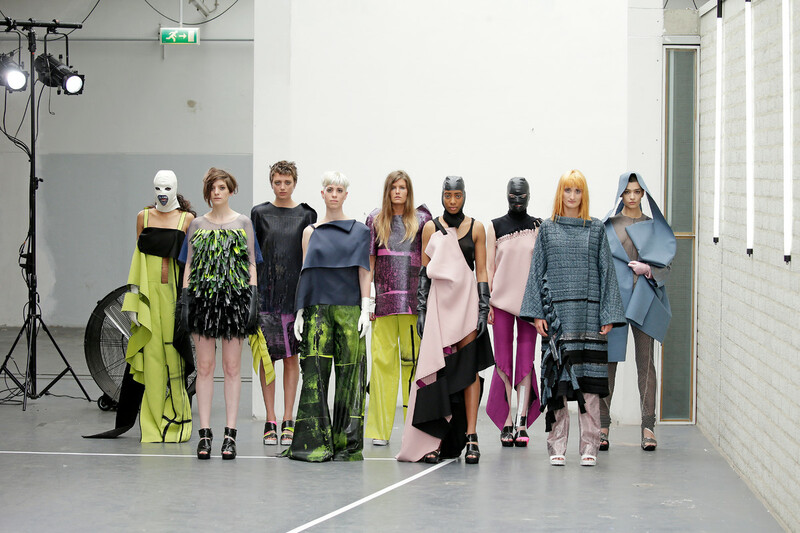 Among them are two graduates which are nominated for the Frans Molenaarprijs 2016: Johannes Offerhaus and Liesbeth Sterkenburg. 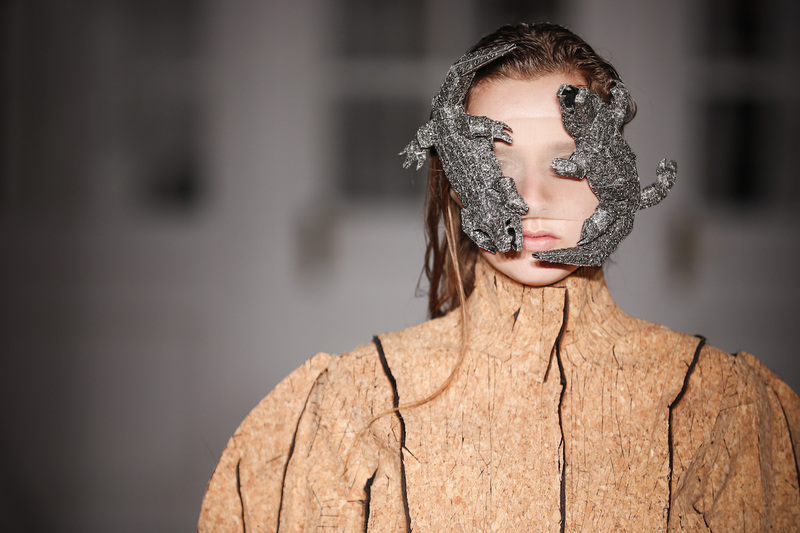 Two other students will represent ArtEZ during Lichting 2016 which show will take place july 7th, Ailene of Elmpt and Johanna Bas Backer. 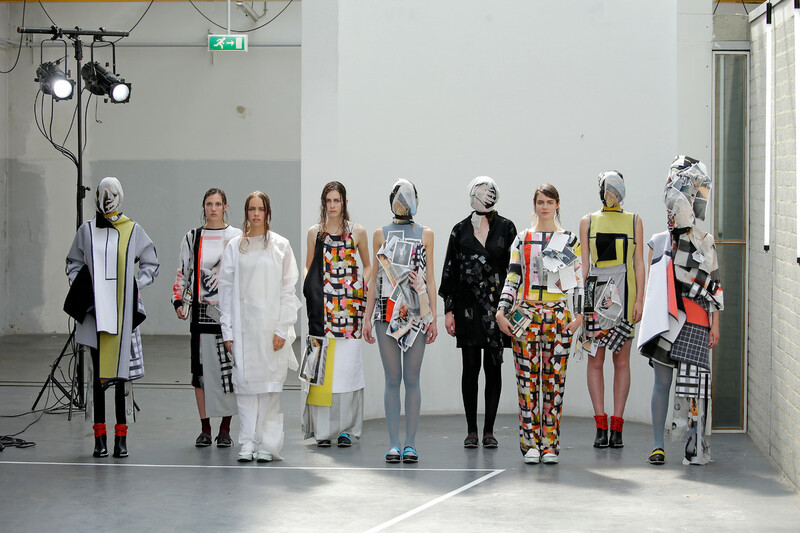 All graduates will show their collections in an exhibition about ArtEZ Finals 2016 in Arnhem from june 29th till july 3rd during the ArtEZ Finals exhibition in the Rietveld building at Onderlangs 9 in Arnhem. 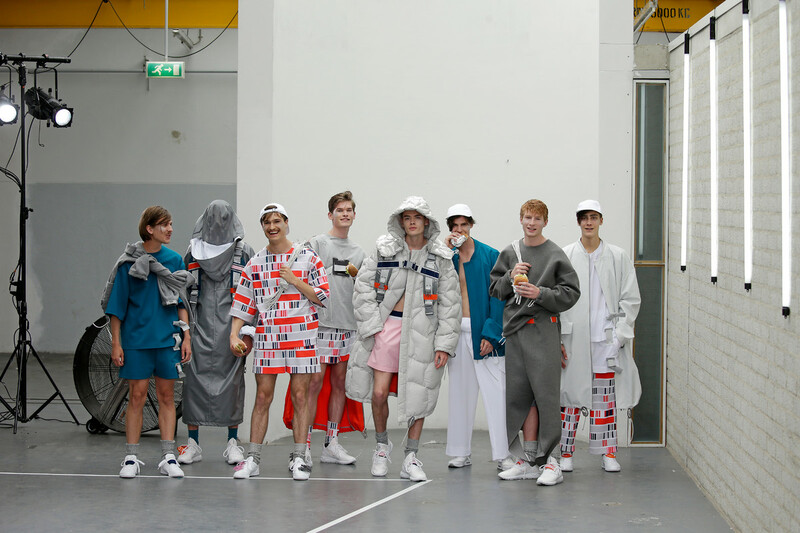 Here are the highlights of the show and groupshots of all the collections. 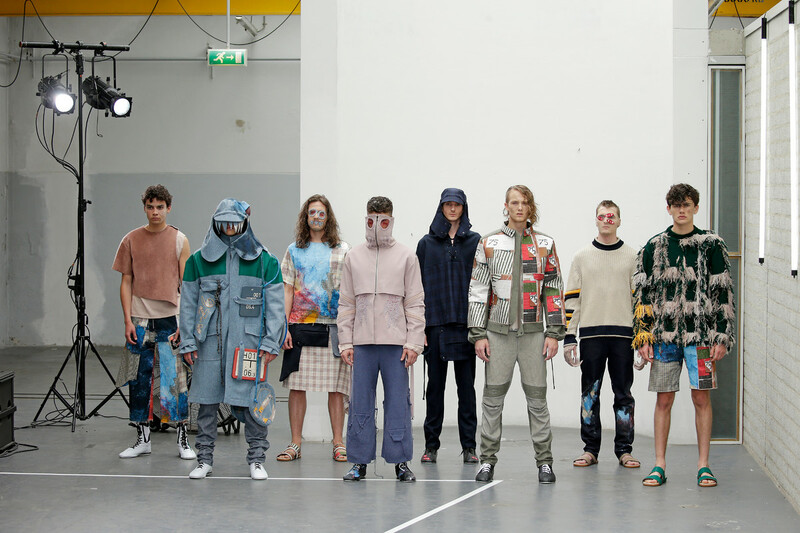 It’s time for Graduation-shows again. 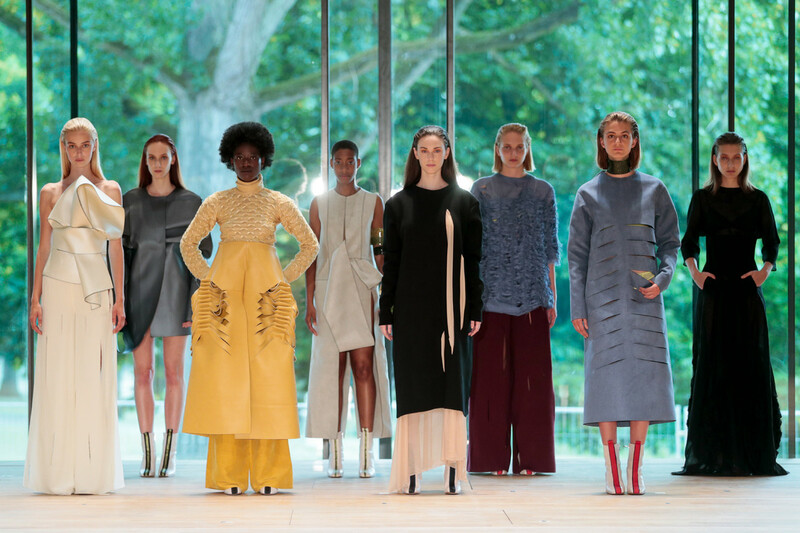 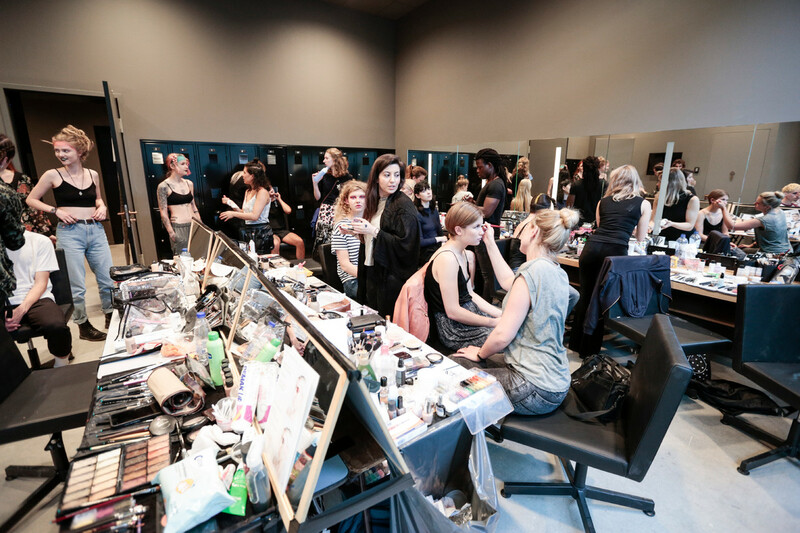 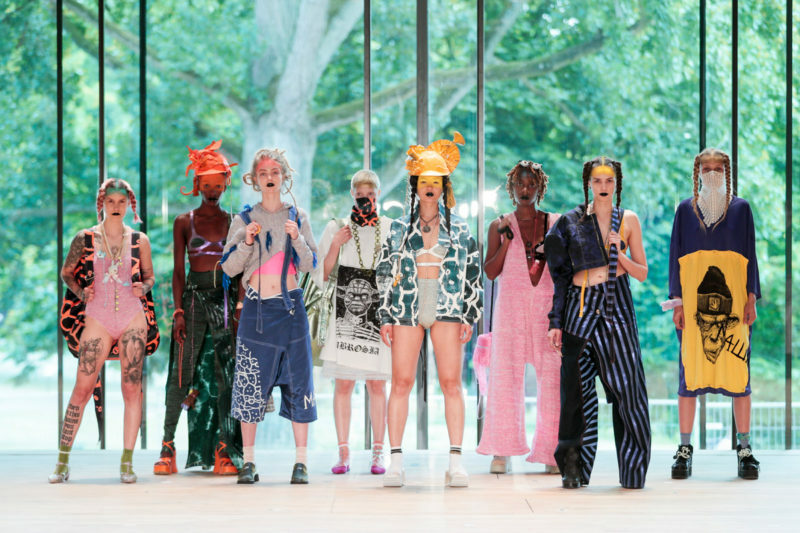 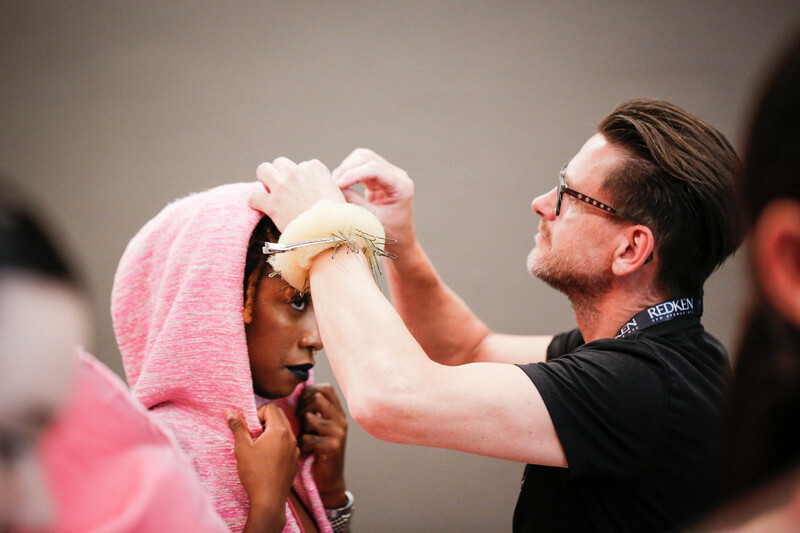 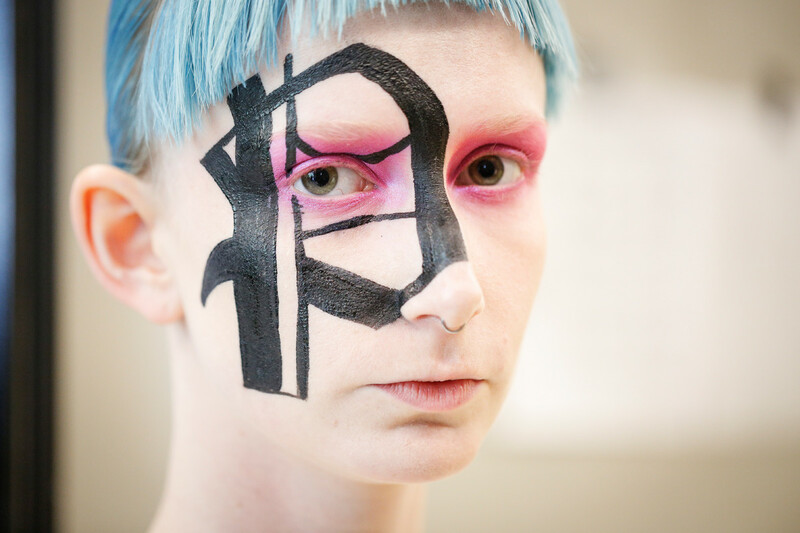 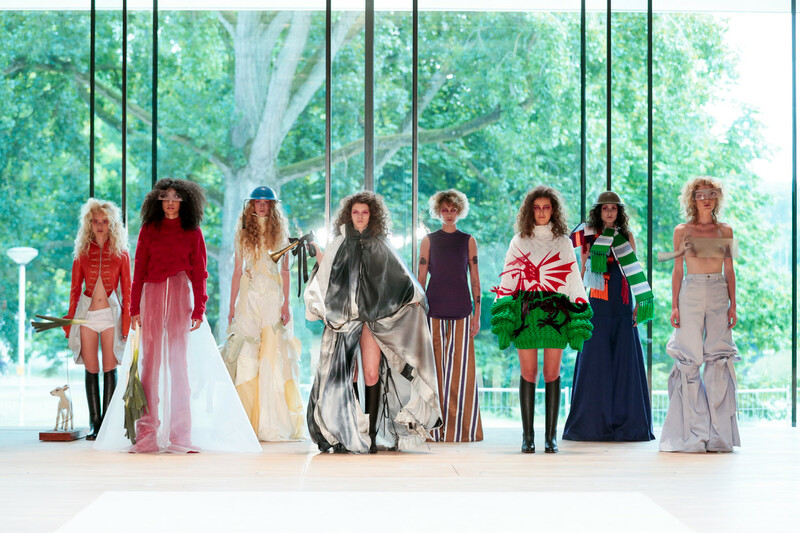 The fashion department of Academy of Fine Arts in Arnhem (ArtEZ) kicked off with a big show, followed later this week by Rietveld Academy. 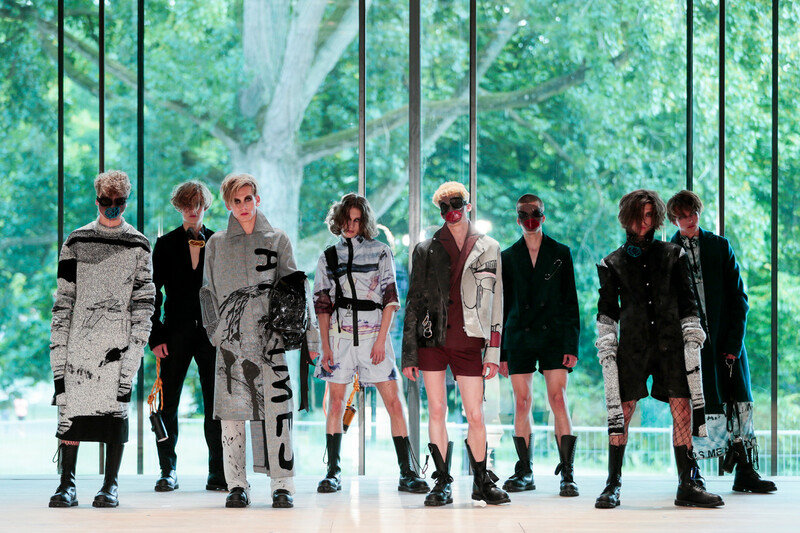 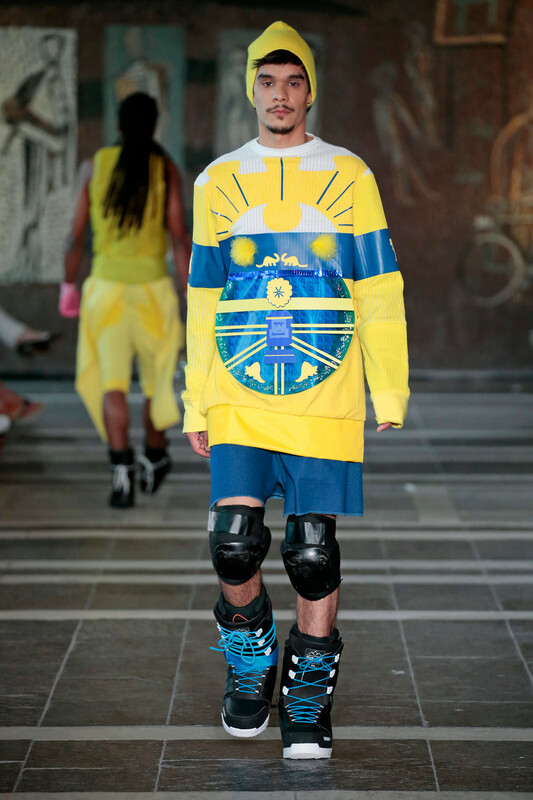 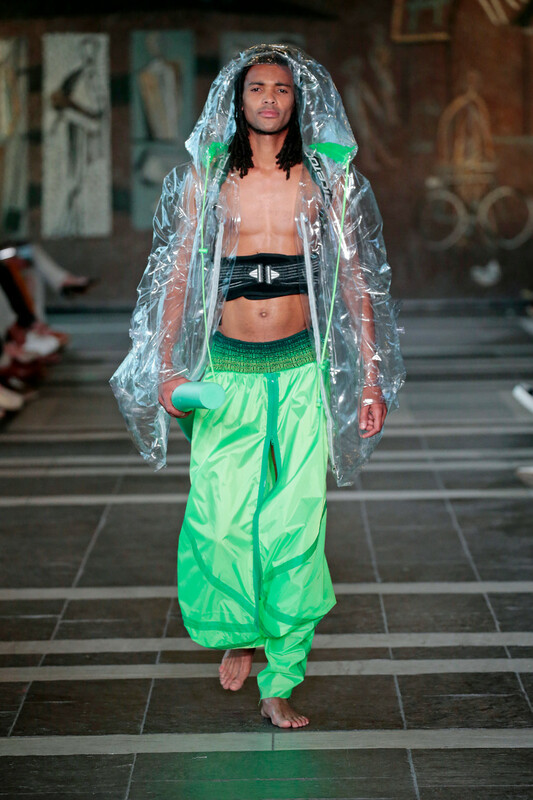 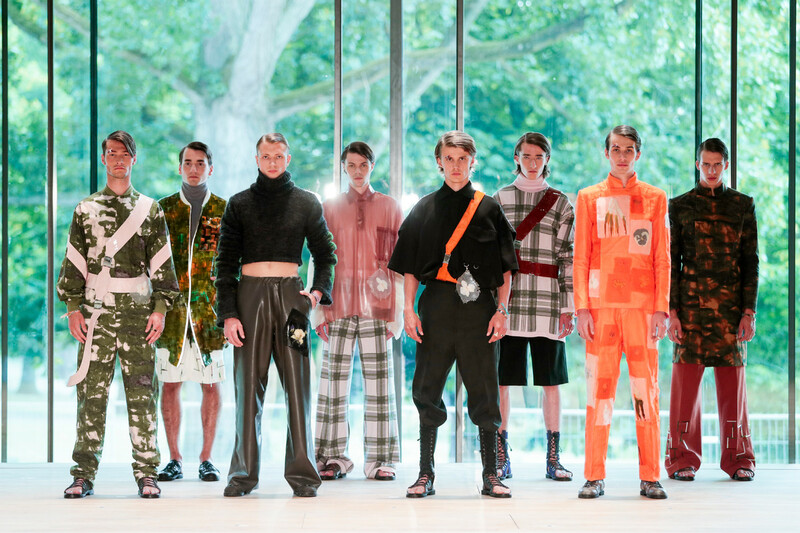 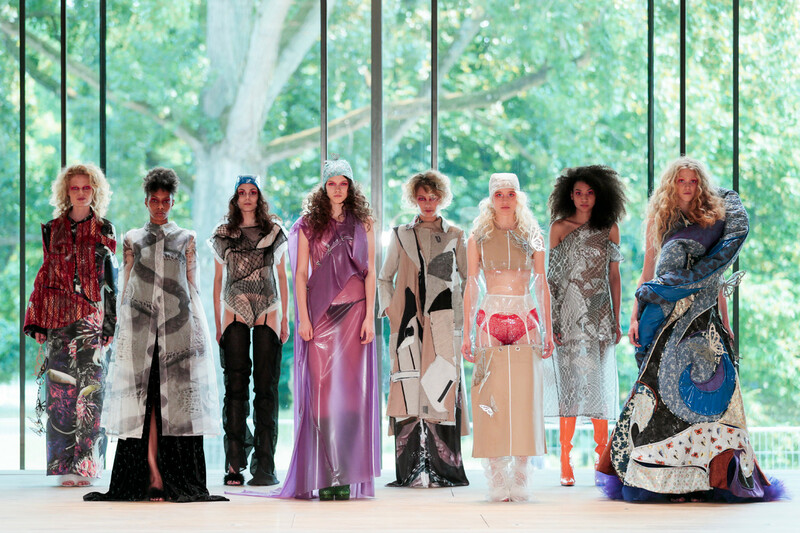 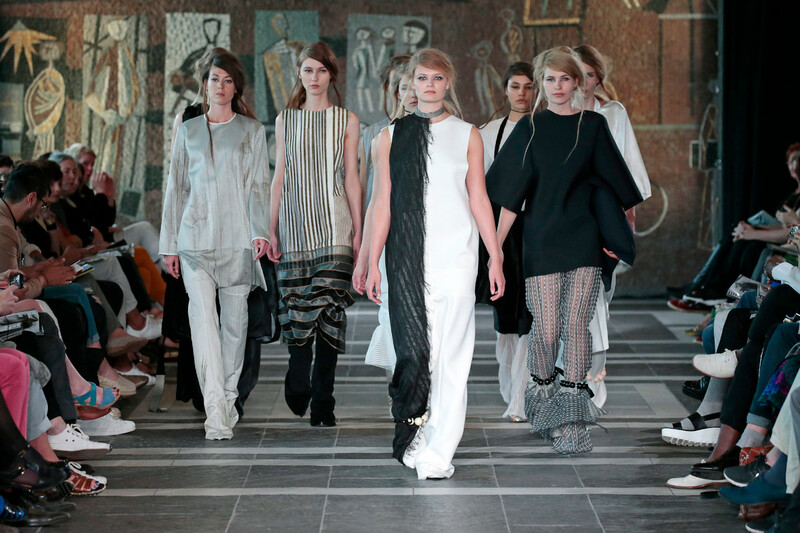 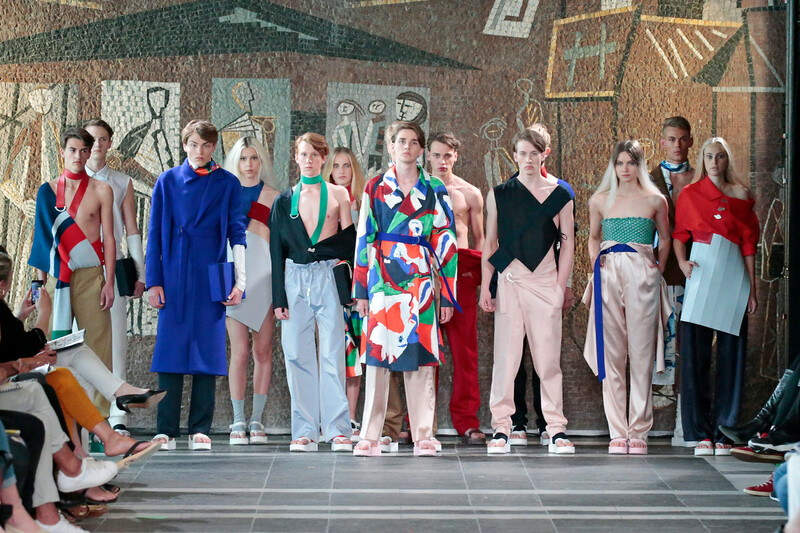 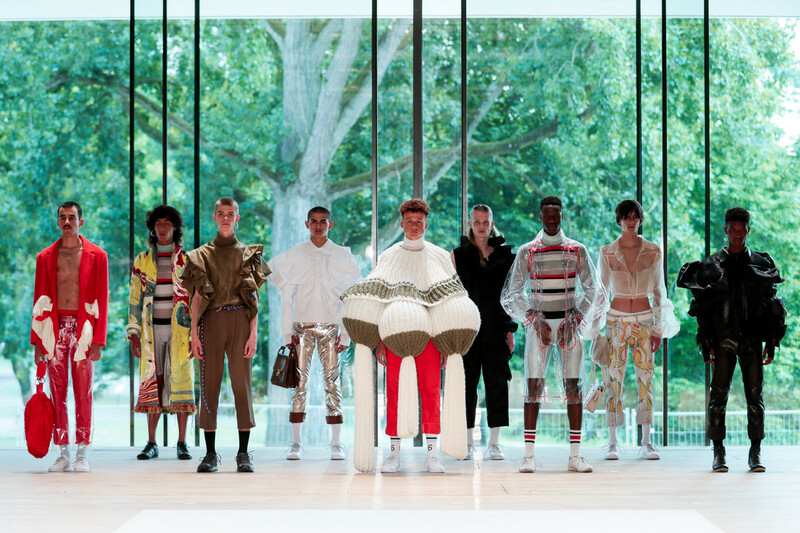 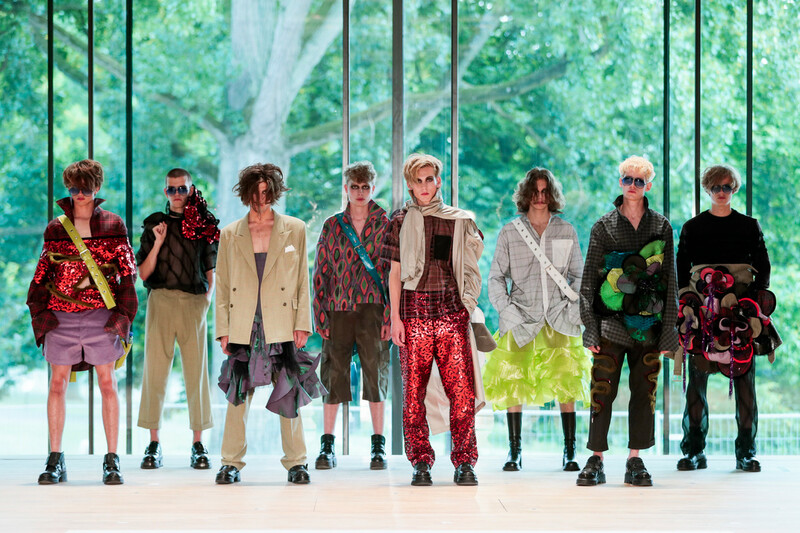 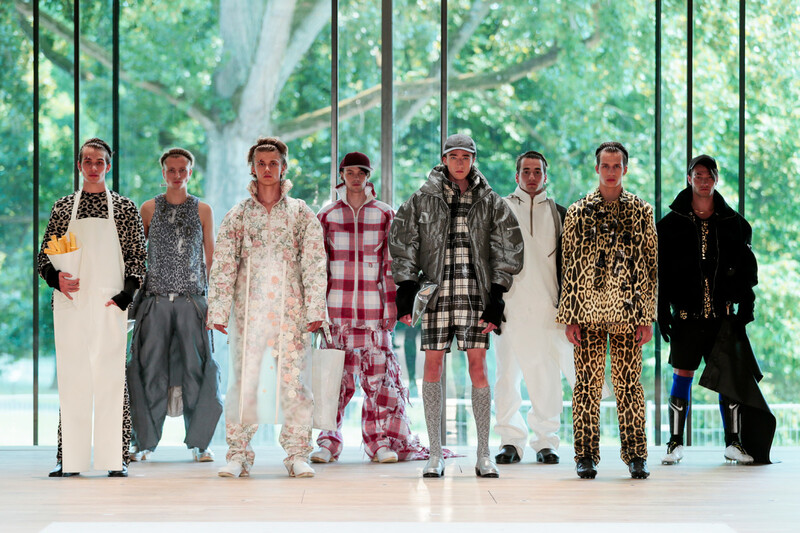 This year 21 students graduated at the Academy in Arnhem, and they presented their collection in the Cityhall of Arnhem. 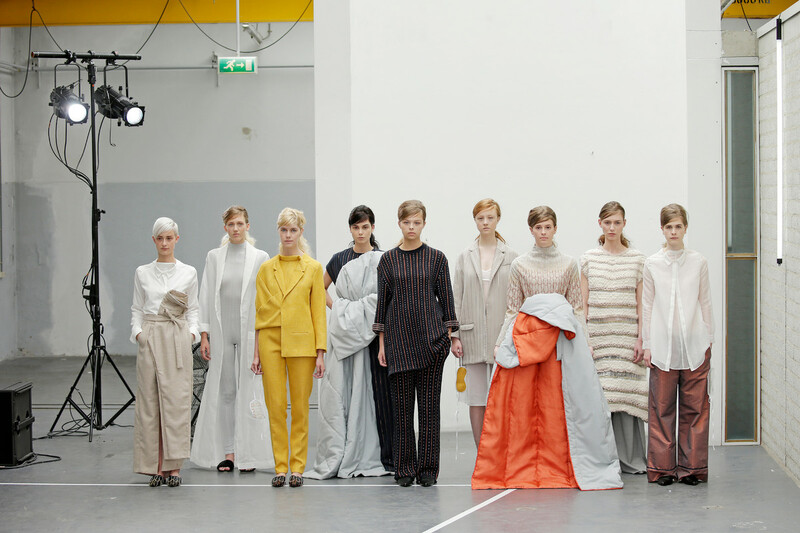 Among them are five graduates which are nominated for the Frans Molenaarprijs 2015: Lilian Admiraal, Josephine Goverts, Max Zara Sterck, Tung Trinh en Maartje Janse. 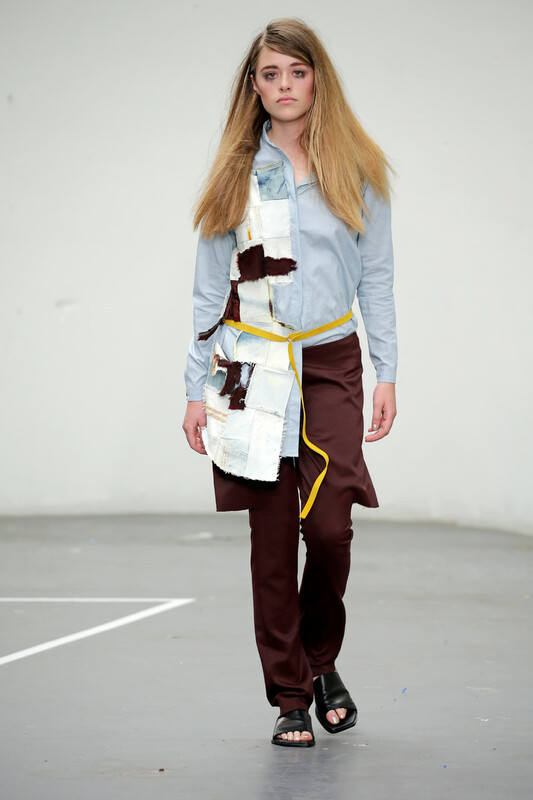 Two other students will represent ArtEZ during Lichting 2015 supported by V&D, Isabelle Tellié and Yvette Peek. 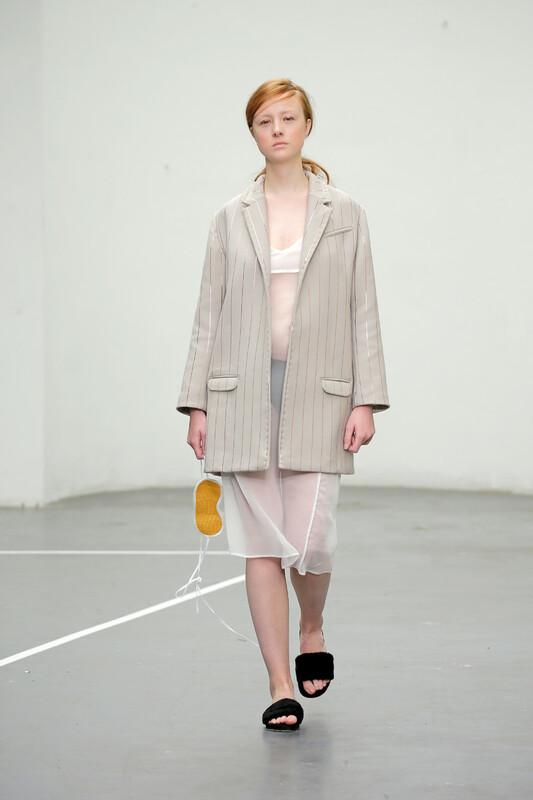 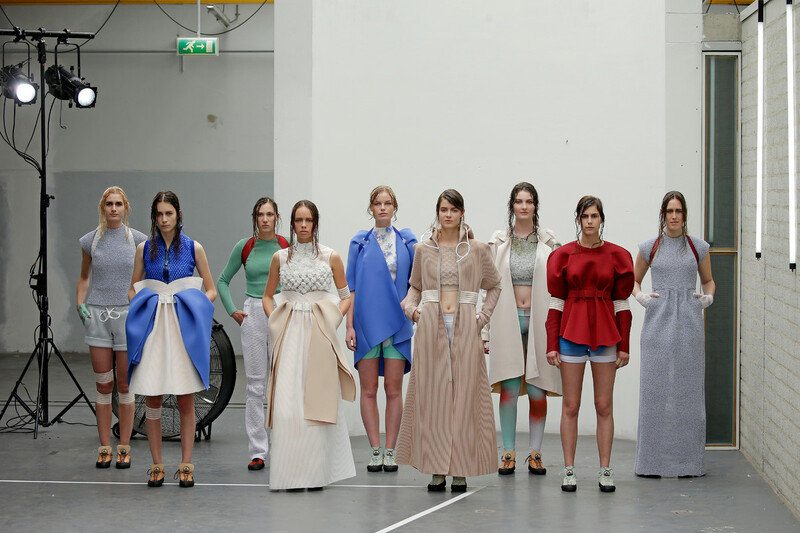 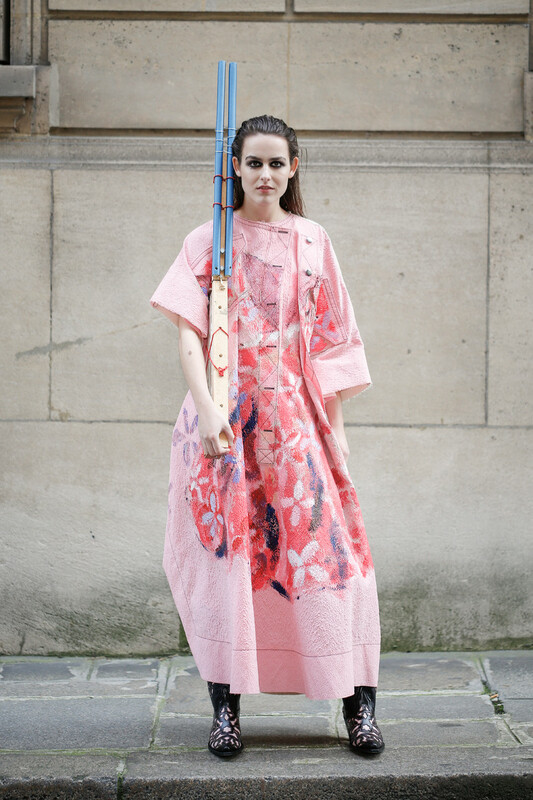 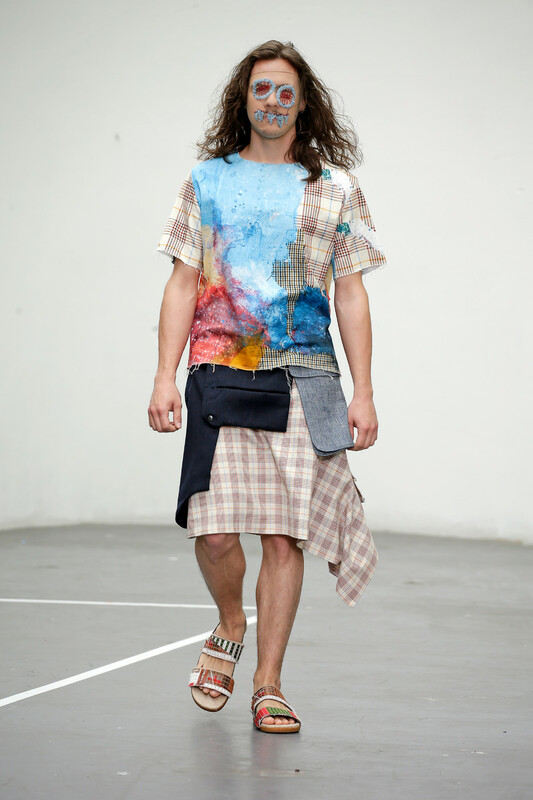 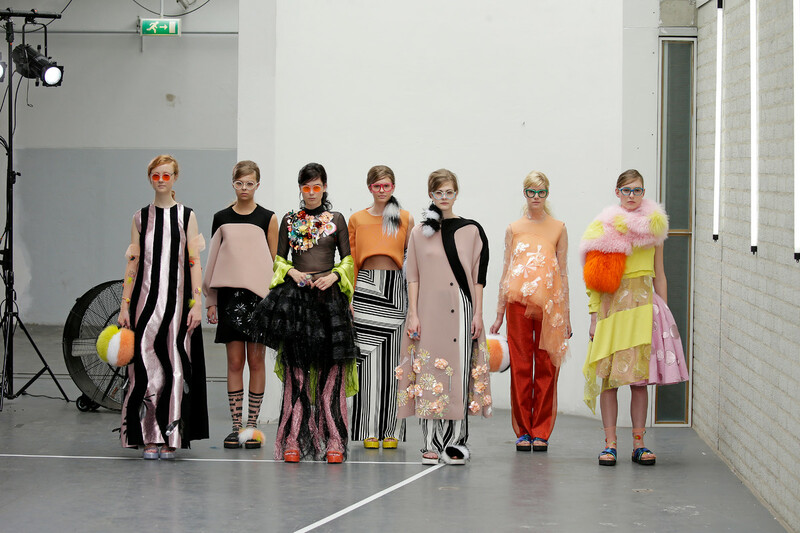 All graduates will show their collections in an exhibition about ArtEZ Finals 2015 in Arnhem from july 1st until 5th. 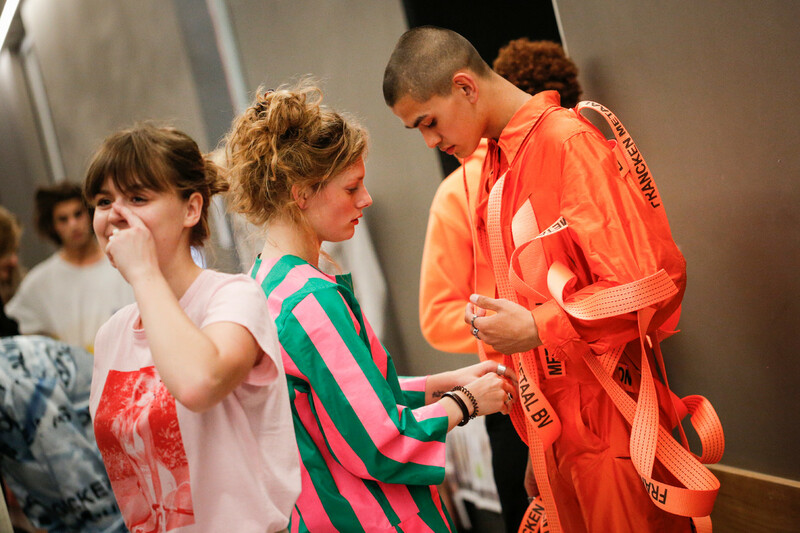 The address: the former bankbuilding of ABN Amro at Gele Rijdersplein in Arnhem. 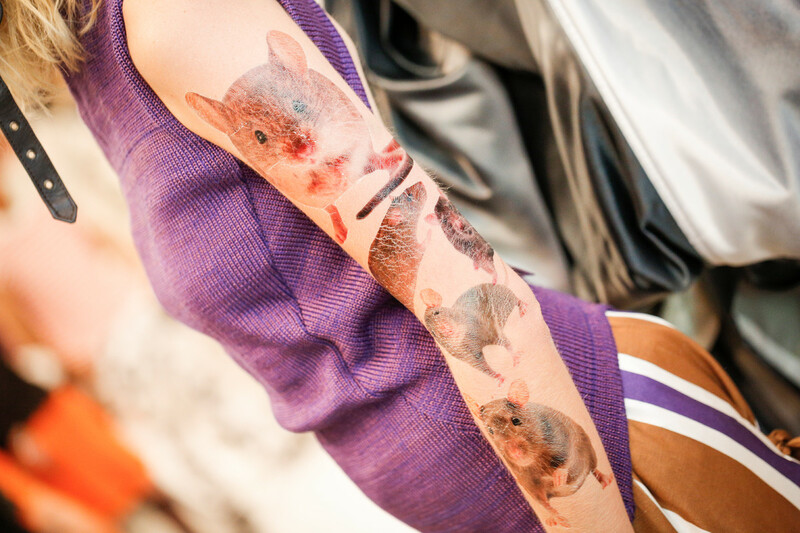 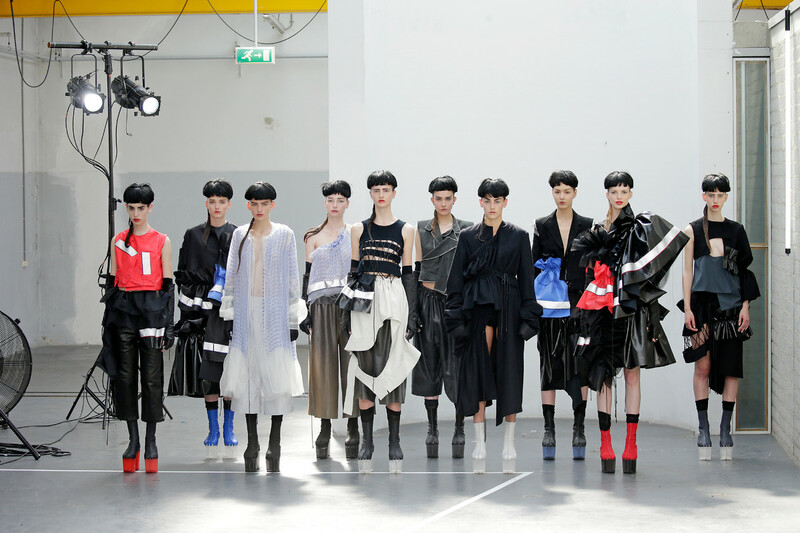 Here are the highlights of the show and the collections. 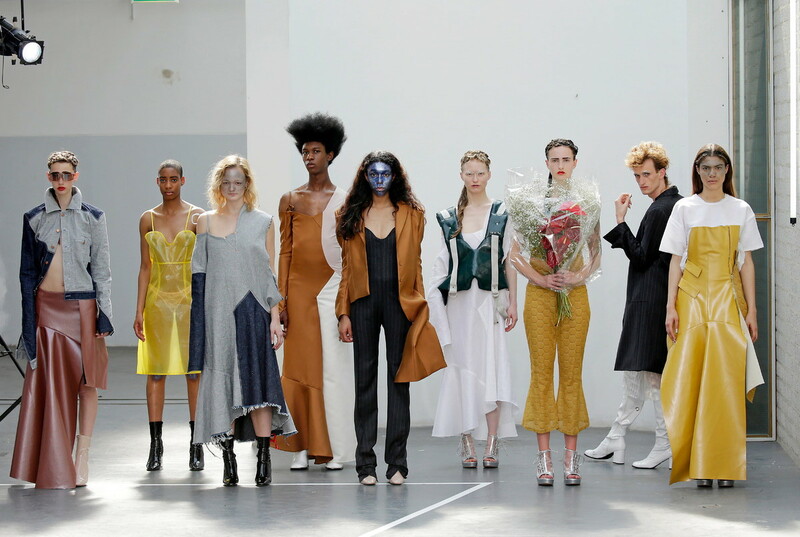 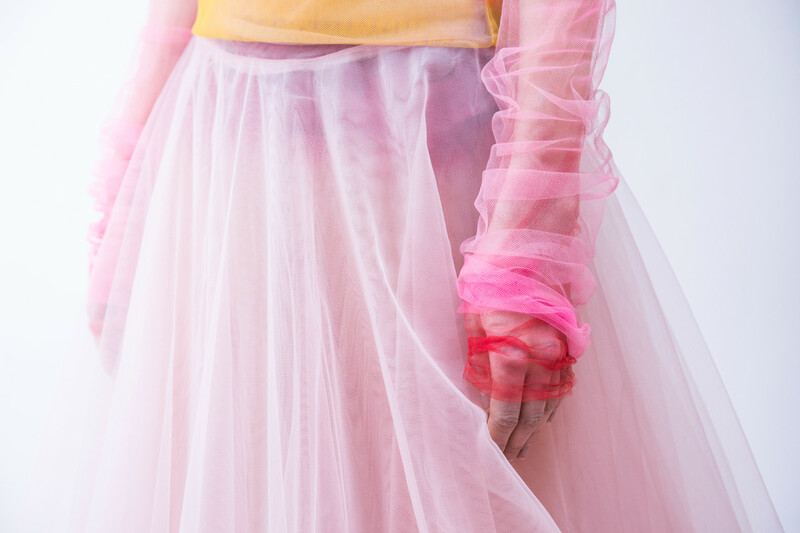 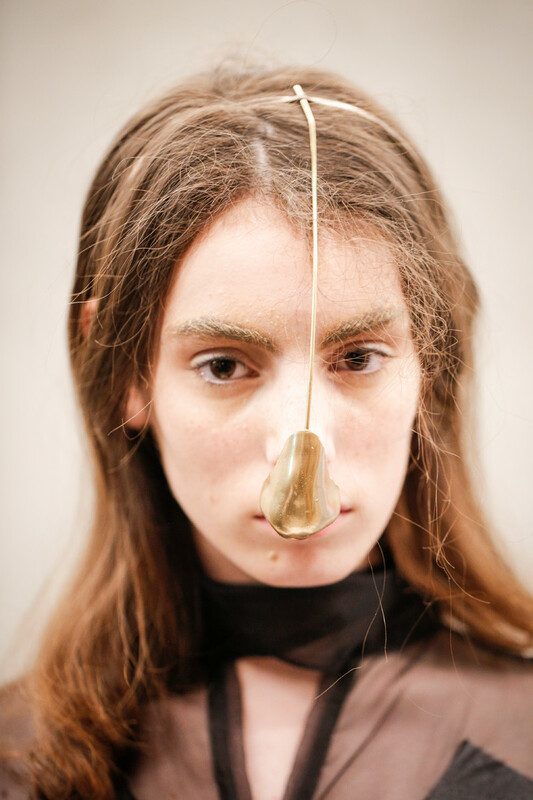 Five master design students of ArtEZ institute of the Arts Arnhem presented their highly personal visions on fashion in an intimate presentation yesterday at the Atelier Néerlandais. 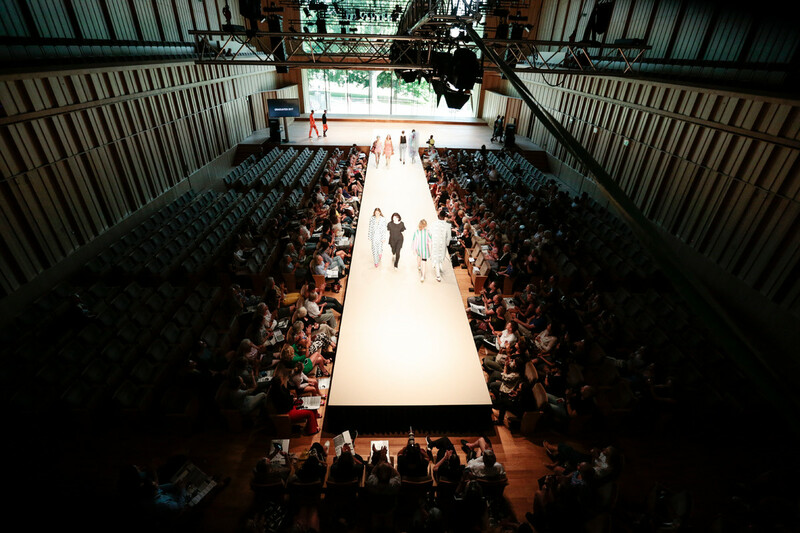 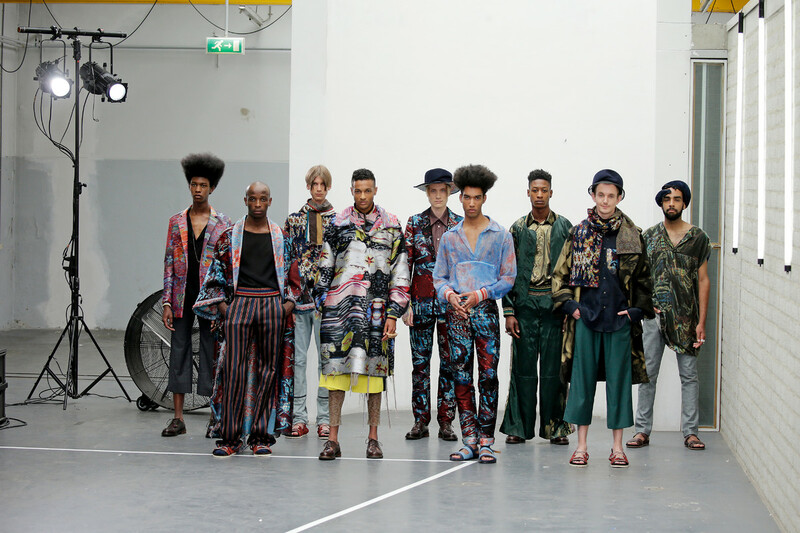 Labelled “Arnhem Masters in Fashion”, the 16th generation of the institute proved that an impactful presentation is not reserved for big catwalk shows. 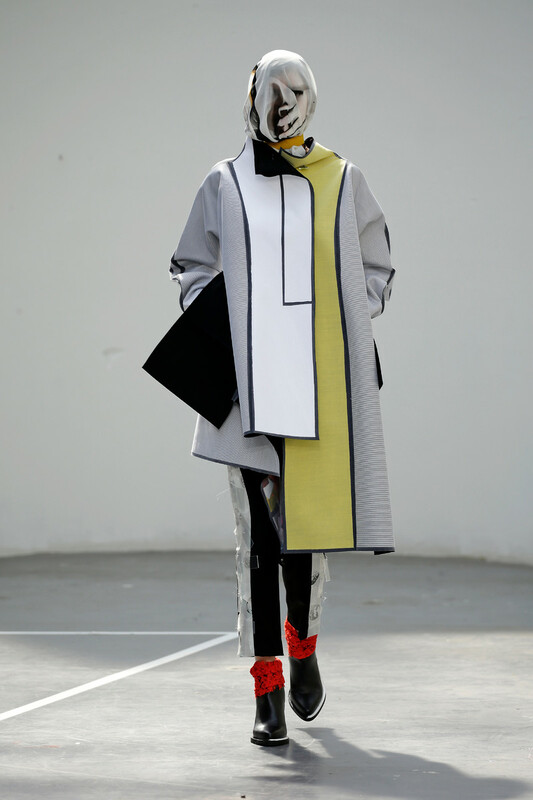 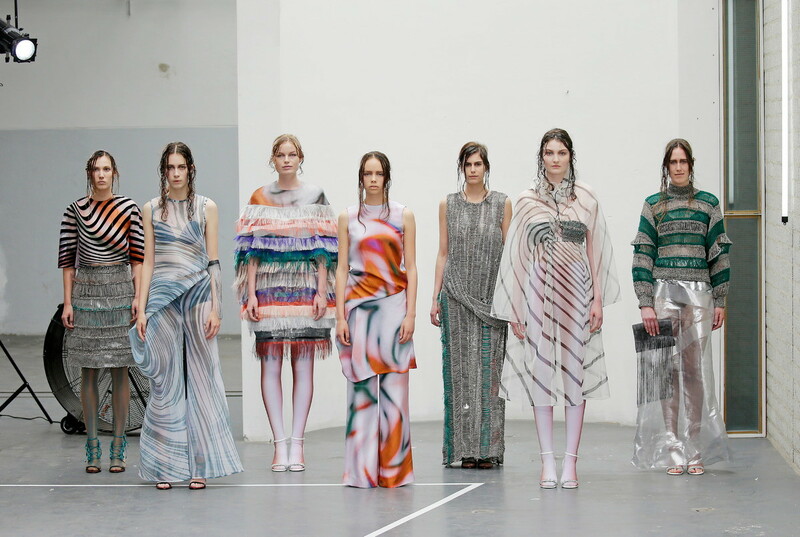 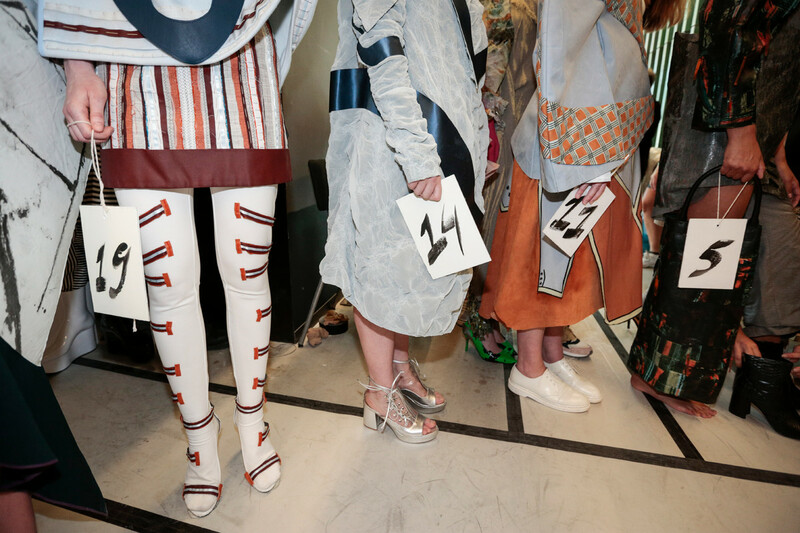 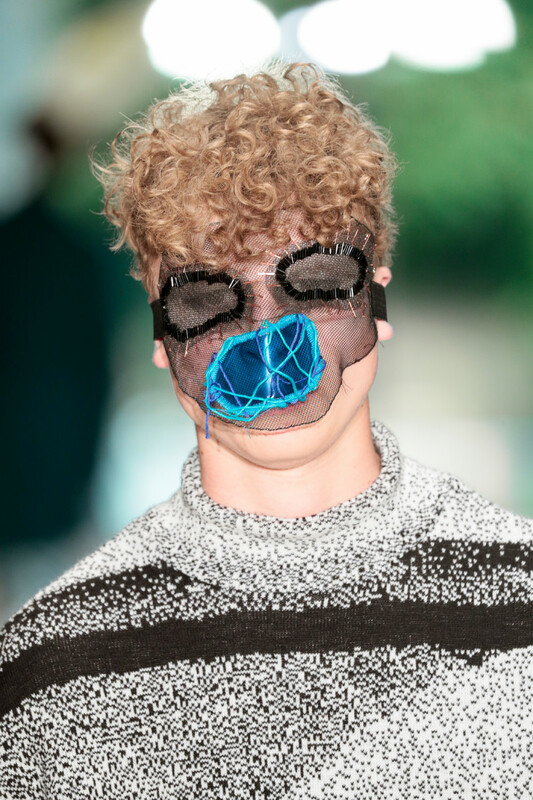 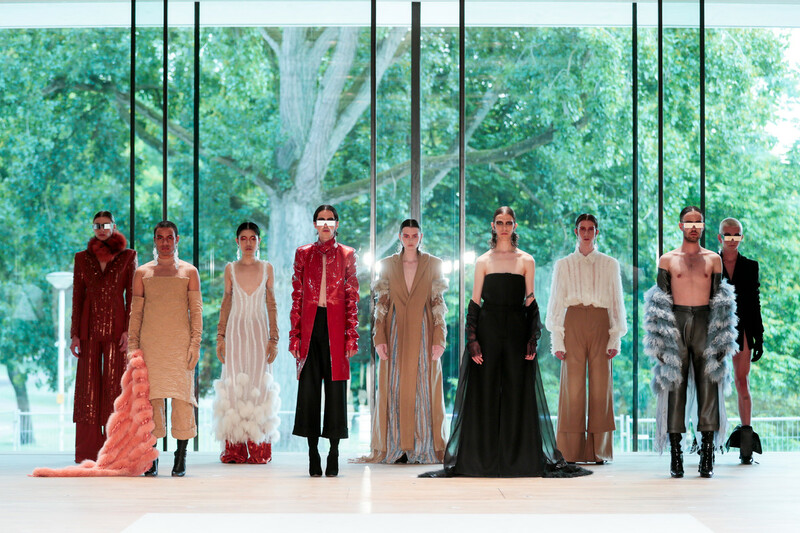 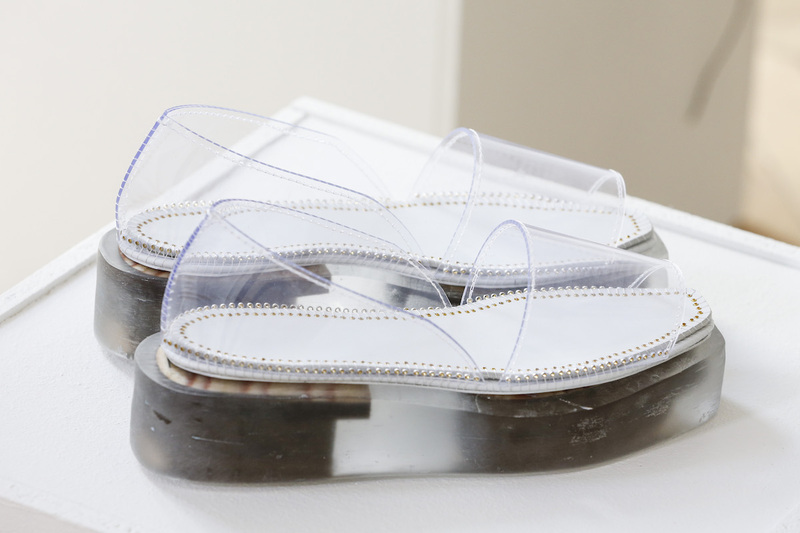 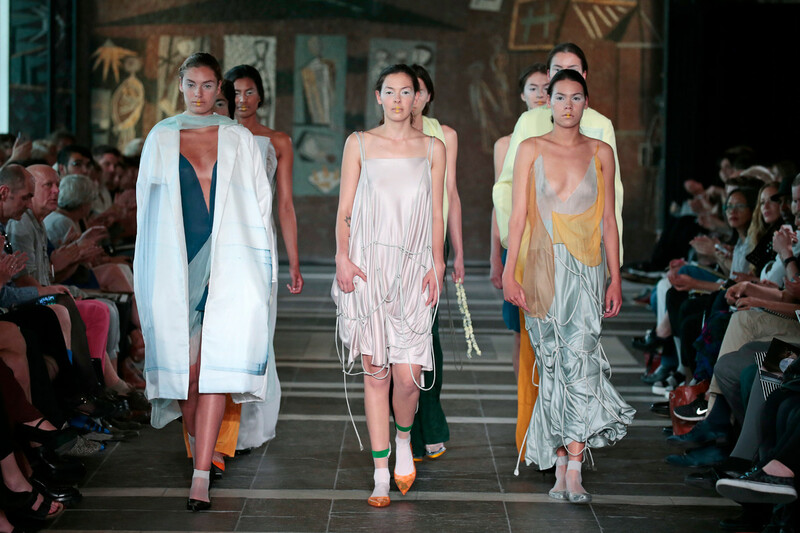 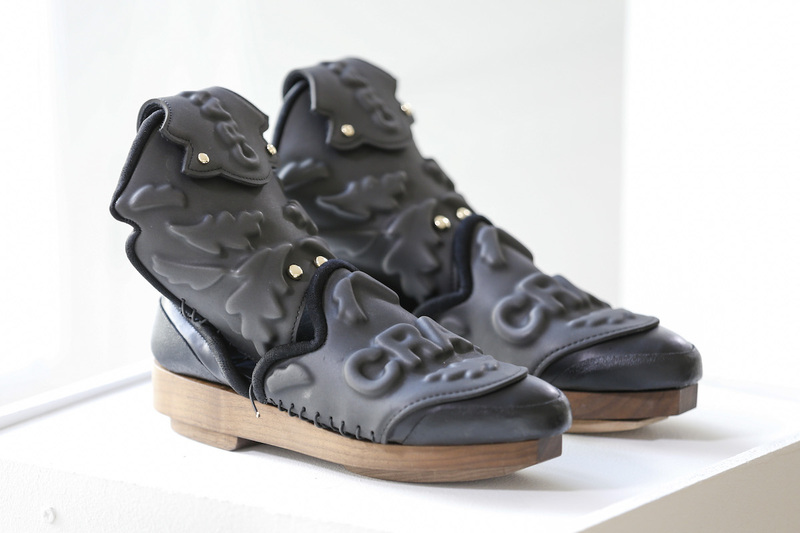 In a small-scale and multidisciplinary presentation, fashion designers Haesung Bong, Anja Dragan, Nathalie de Koning, Sunanda Koning and shoe designer Chrissie Houtkooper deployed innovative ideas for the future of fashion. 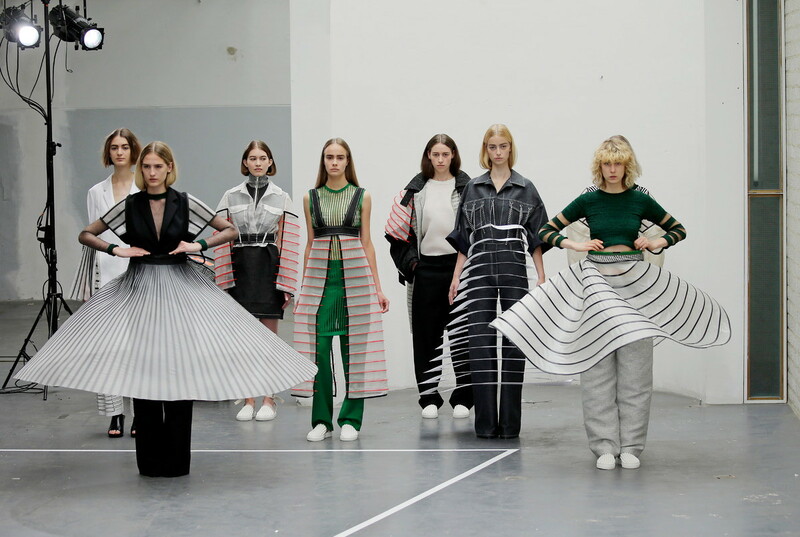 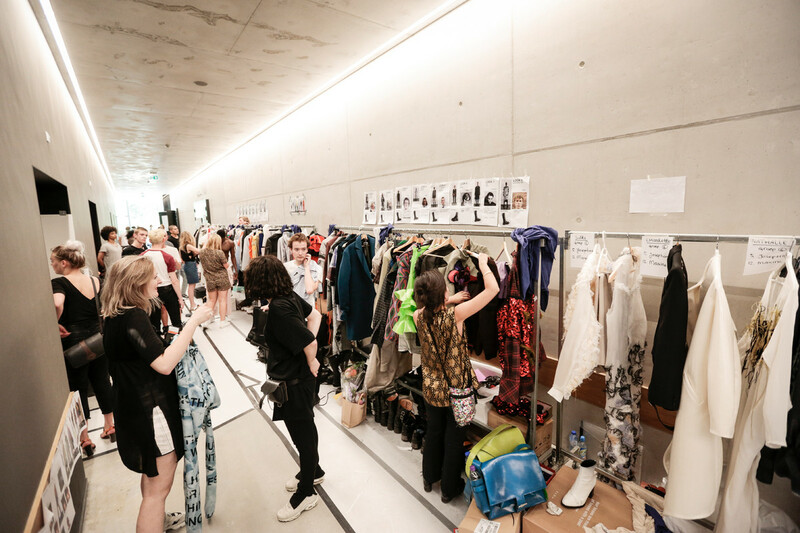 In the corridors of the Atelier Néerlandais, the audience was served new flavors of the designer’s fashion propositions, with a strong emphasis on expressive handmade textile innovations and tactile qualities, in ongoing presentations ranging from group installations and a video projection to perpetuate catwalk movement. 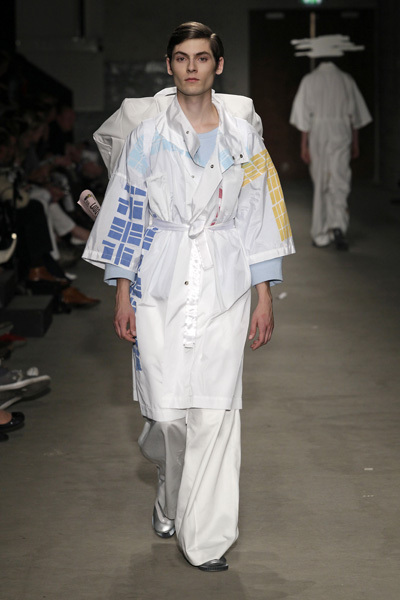 Lichting 2009 presented the best of each of the 7 Dutch fashion academies: Nathanya Zwart, Erna Einarsdottir, Ratna Ho, Ireneo Ciammella, Kai Salomon, malousebastiaan, Joran de Kok, Bregje Cox, Liesbeth van Gemeren, Aida Saracini, Ann Boogaerts, Marina Krunic, Twan Meijerink and Manon Boertien. 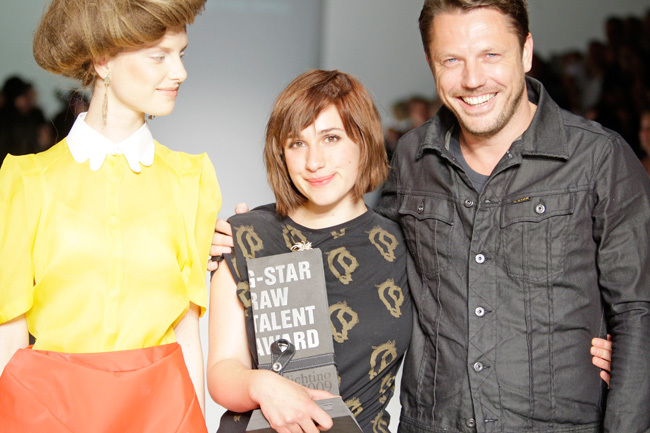 Ann Boogaerts won the G-Star Raw Talent Award, a price worth 10.000 euro. 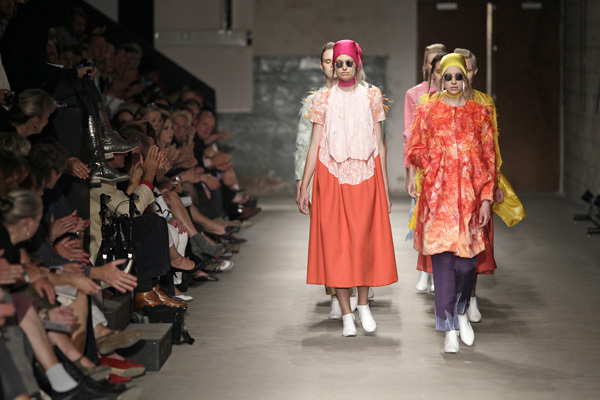 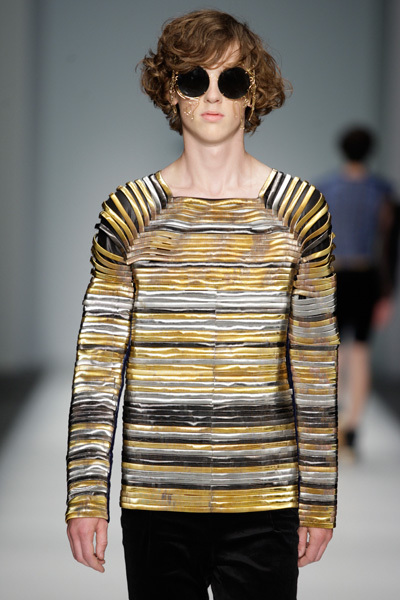 Lichting 2009 turned out to be one of the most spectacular catwalk shows during this season’s Amsterdam Fashion Week. 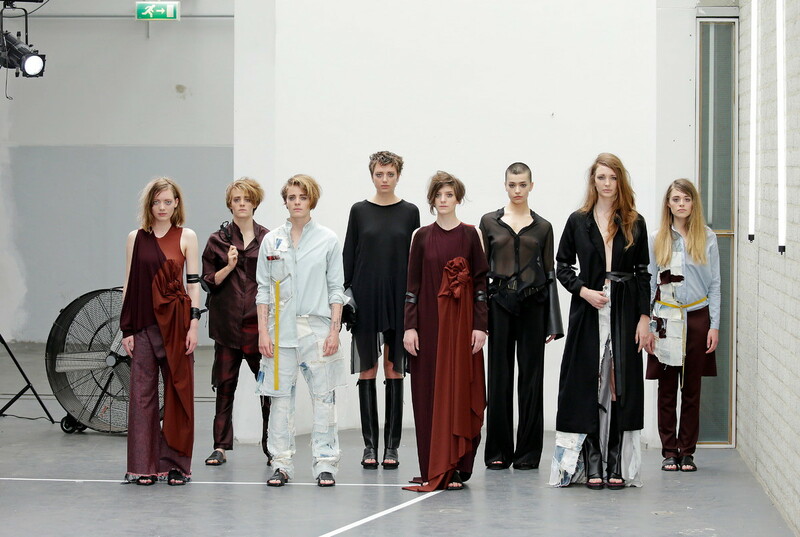 Lichting is a unique platform founded to fill the gap between Dutch fashion academies’ most promising students and the professional fashion industry. 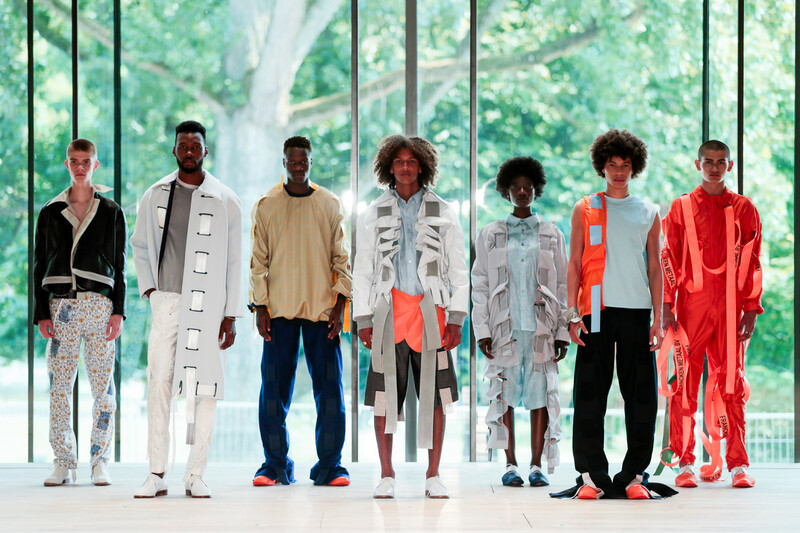 This season’s Lichting show covered the collections of 14 students, 2 of every fashion academy and was sponsored by G-Star Raw. 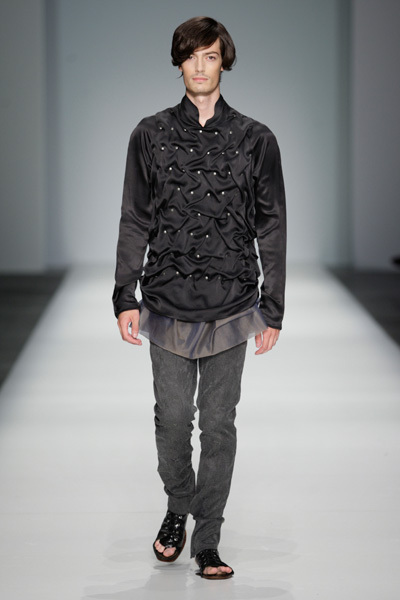 The best designer won a price worth 10.000 euros and a trip to G-Star’s presentation at NYC Fashion Week. 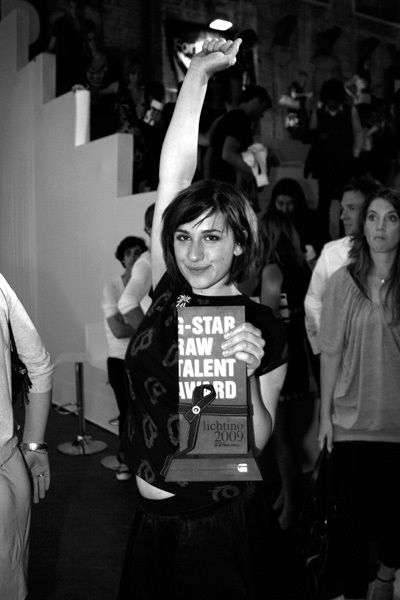 Ann Boogaerts of ArteZ won the G-Star Raw Talent Award. 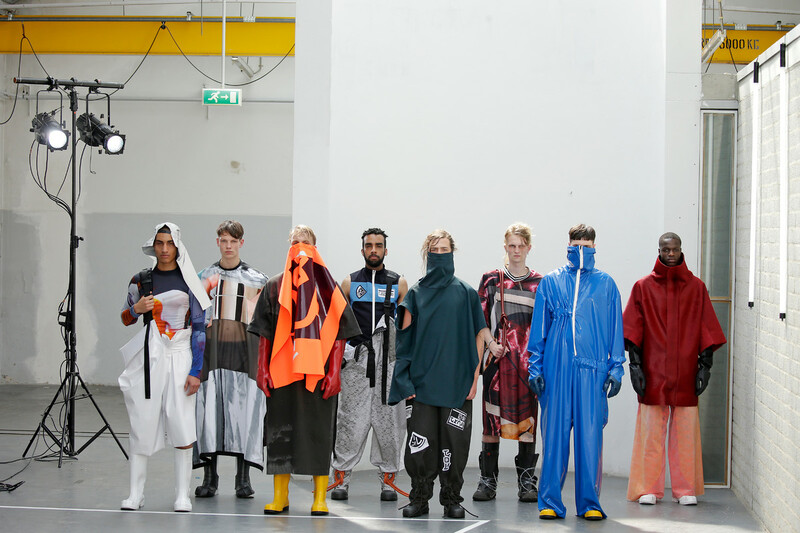 A panel, consisting 4 of Europe’s most important fashion professionals (Wendy Dagworthy, co-founder of London Fashion Week, Garance Doré, writer and photographer, Susanna Lau, editor of Dazed & Confused and Lucas Ossendrijver, designer for Lanvin Homme) chose Boogaarts as best young designer. 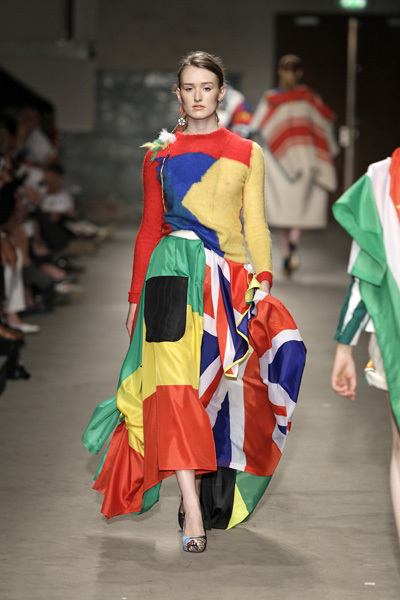 All collections captured of-the-moment elements in global fashion. 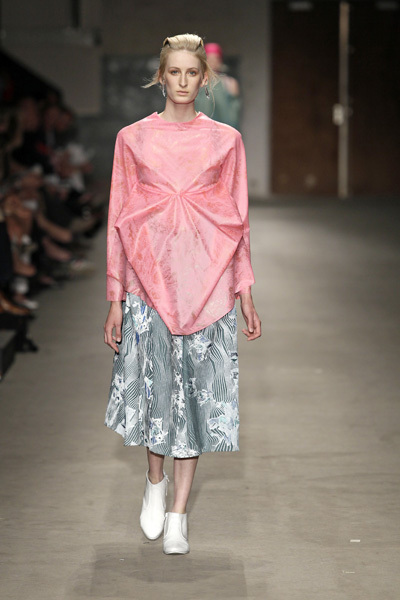 Like the pastel color gradients and oversized pieces with focus on shape. 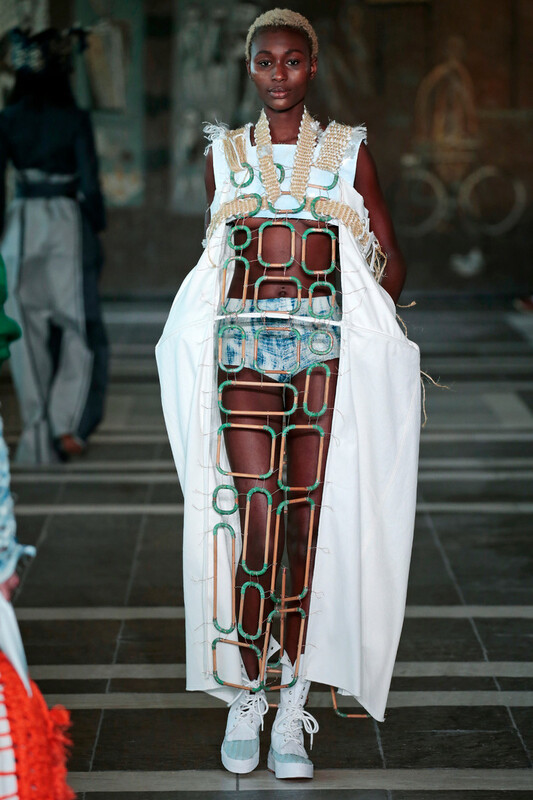 Also deconstruction, showed by studded and bead-covered outfits. 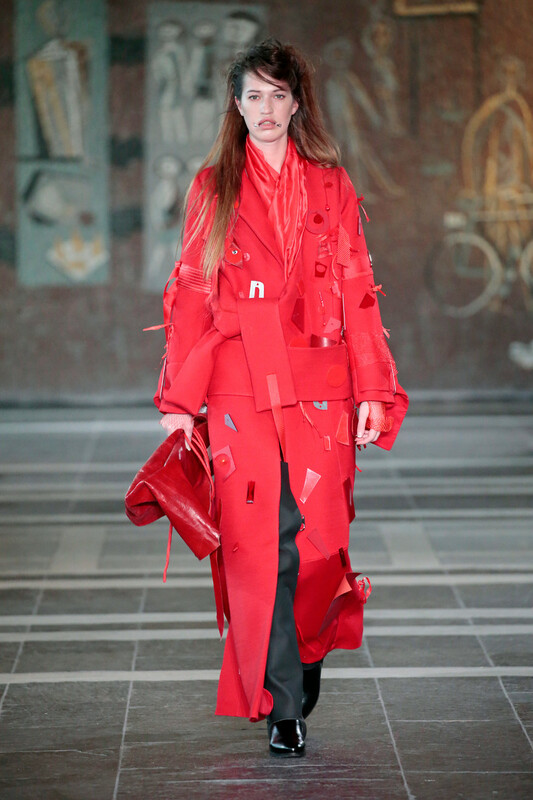 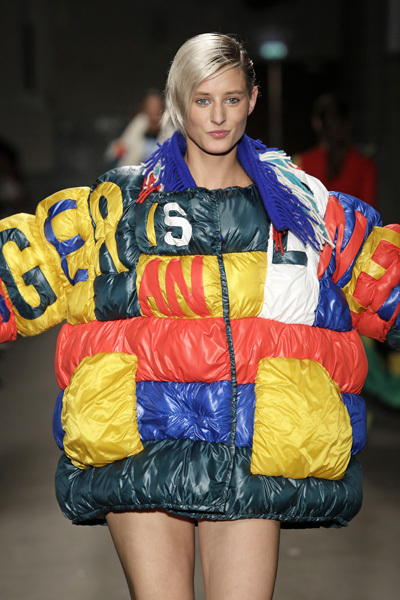 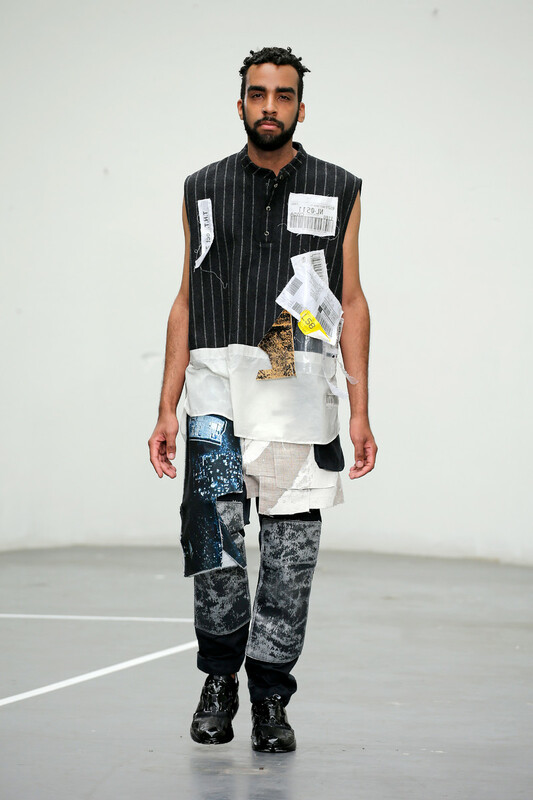 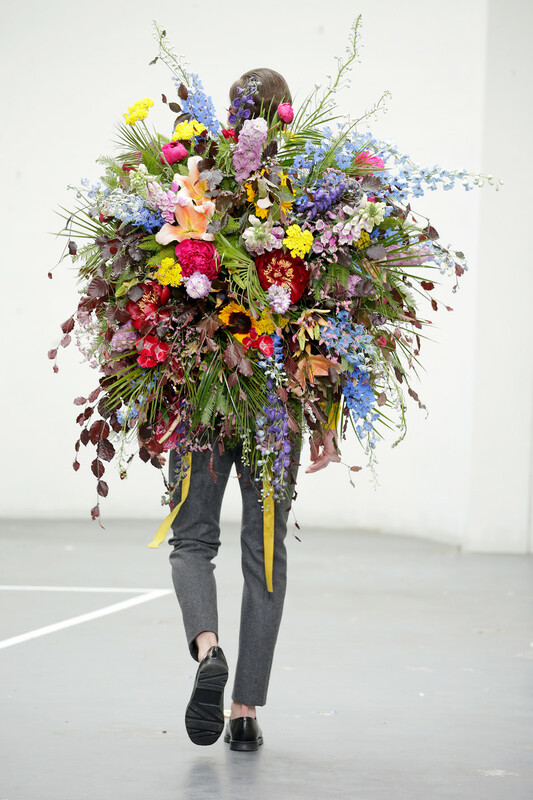 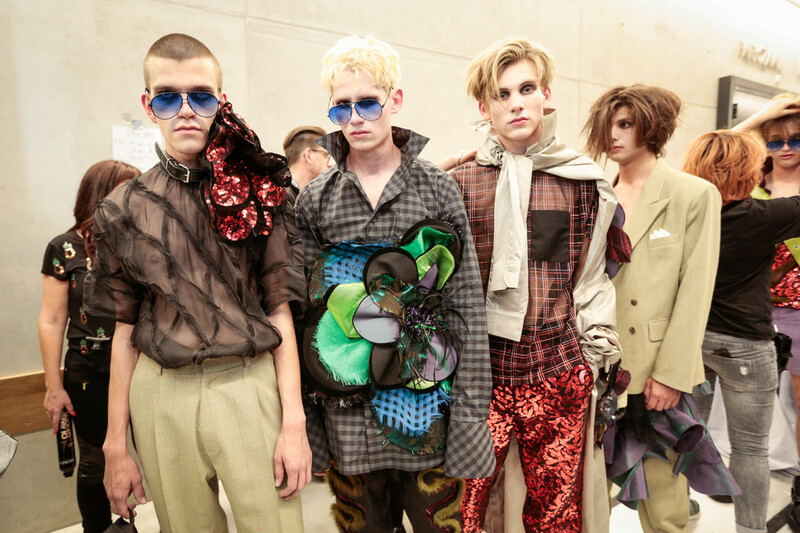 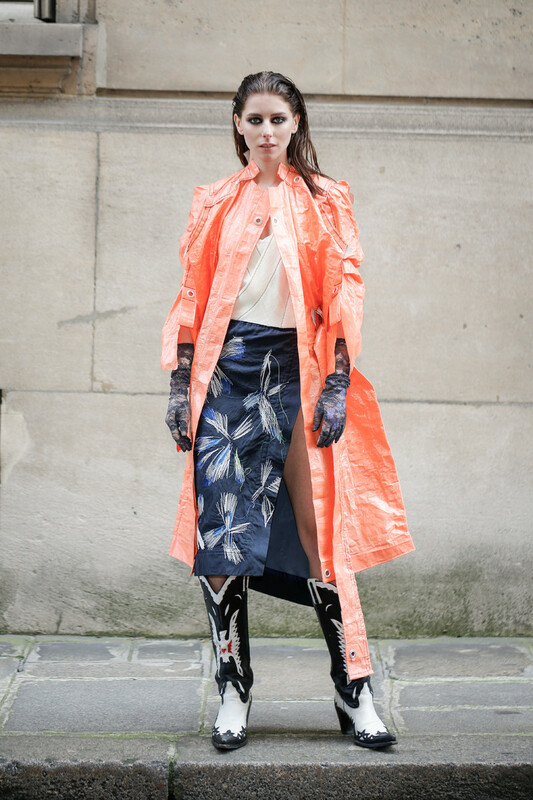 Some collections looked like chaotic outfits made from ripped, cut and draped materials. 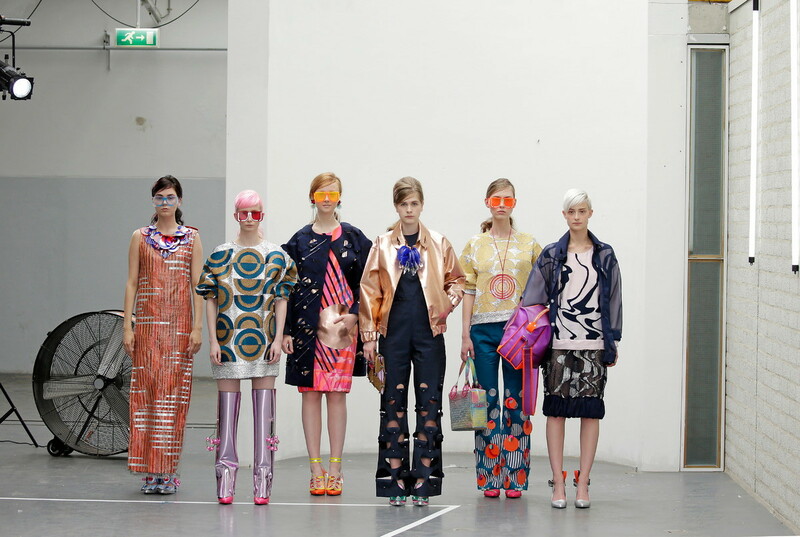 The best collections were the ones that were least on-fashion, showing something new. 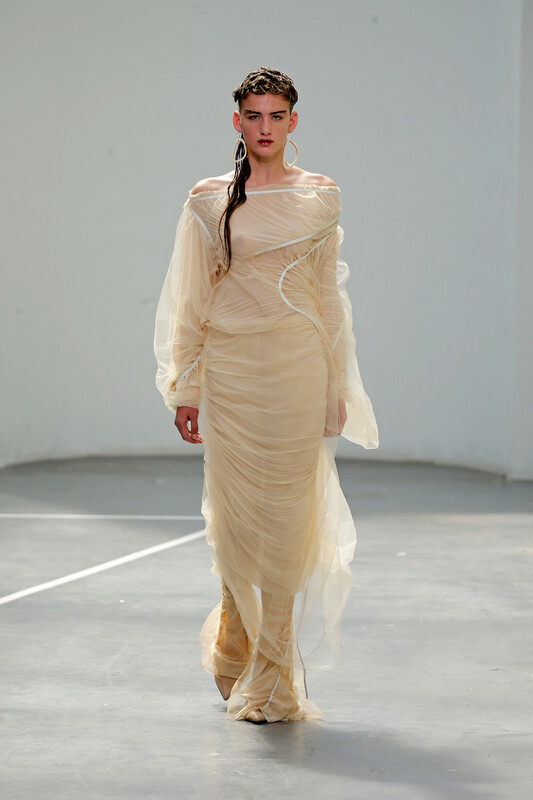 Like Ratna Ho’s collection, inspired by the ugliness of tribal tattoos, which resulted in curvy pantyhoses, pleated skirts and tops made of see-through materials. 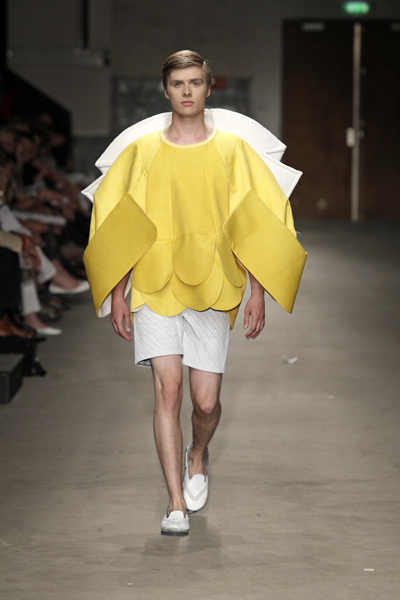 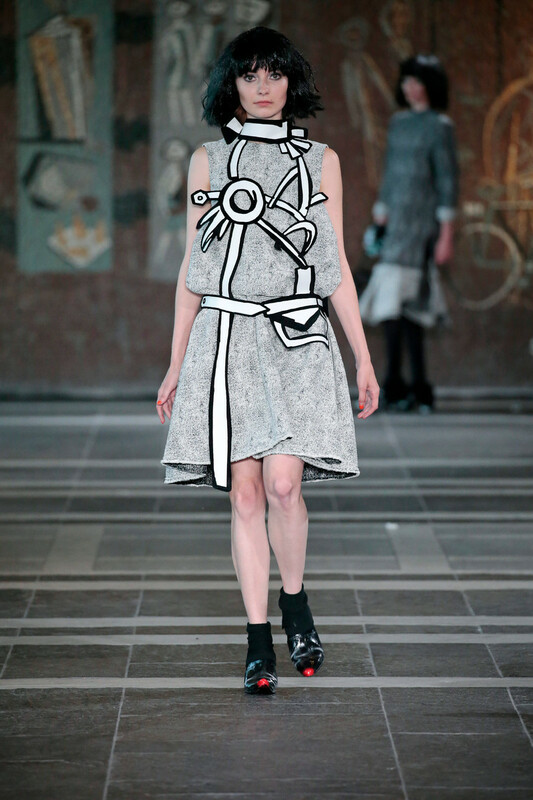 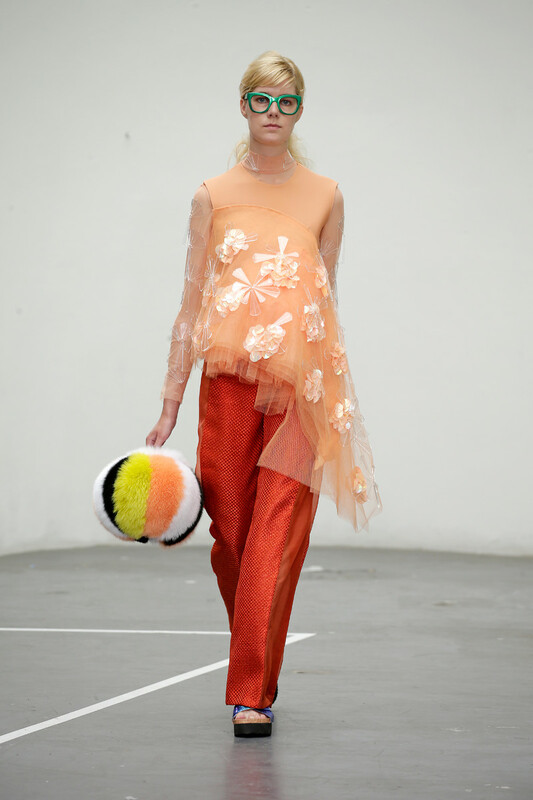 Designer-duo Malousebastiaan chose to use a round shape which doesn’t have a start or finishing point. 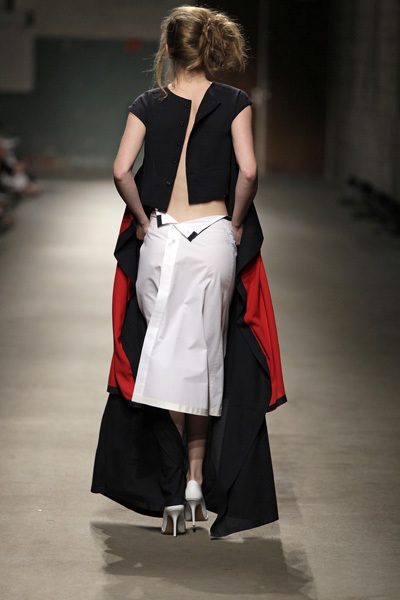 Round curves were translated into blown-up silhouettes and dresses looked like they were grown organically. 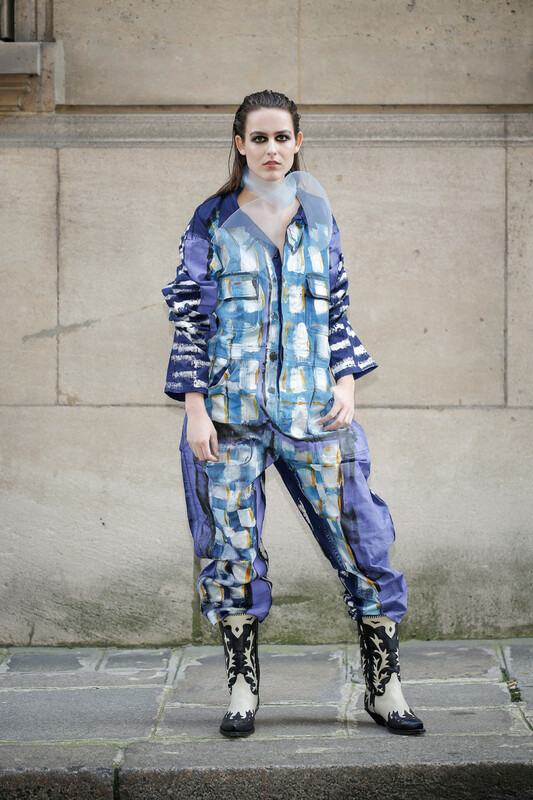 Bregje Cox was inspired by big cities’ super structures and rare etnical images. 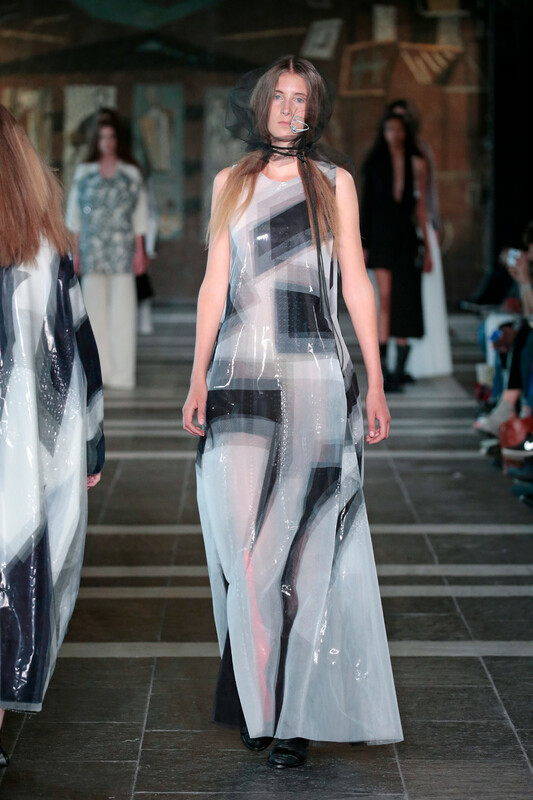 Cut-open dresses and big mirror elements looked like Asian symbols or an aerial road map. 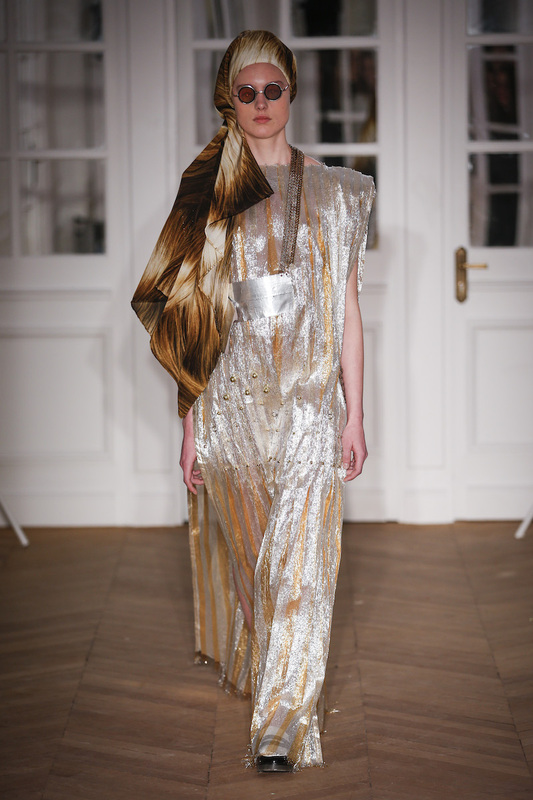 Manon Boertien used her positive memories of religion and spirituality and sunlight reflecting crystals as inspiration. 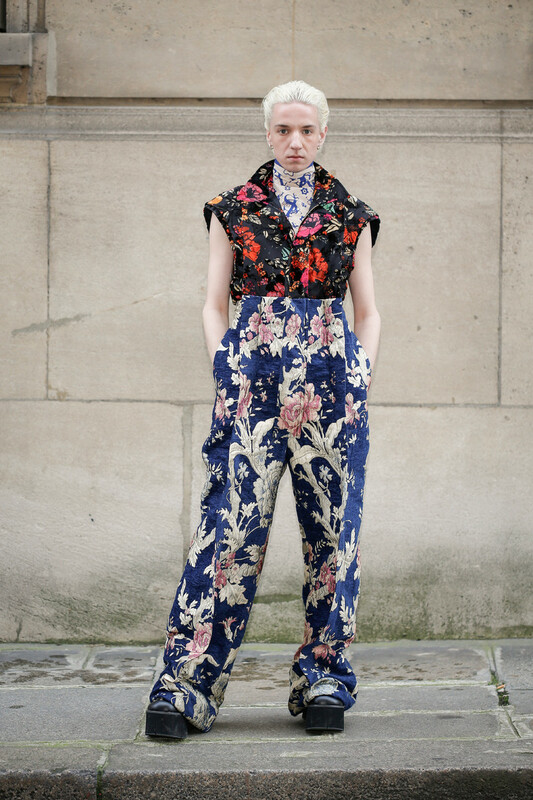 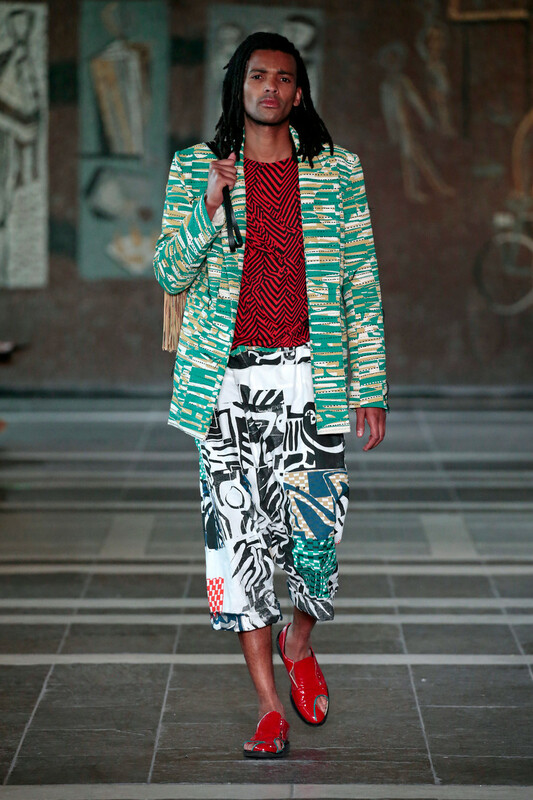 The outfits in bold shapes and facet-like prints looked truly happy and positive. 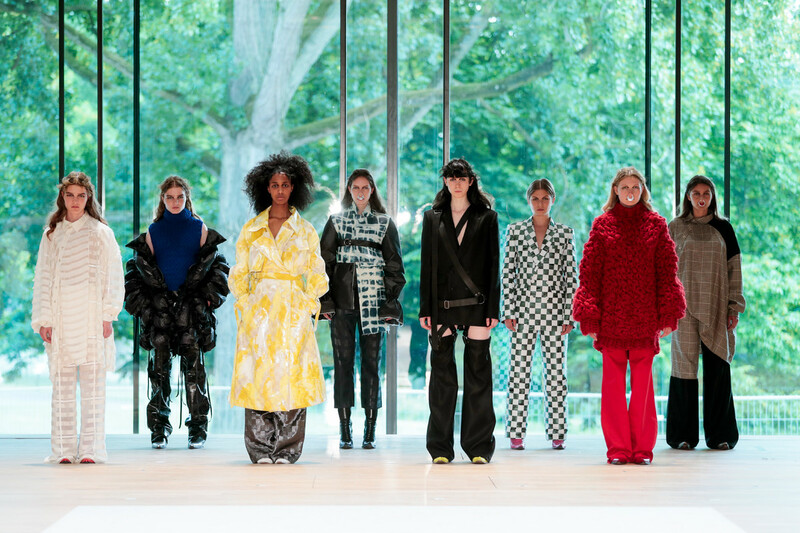 Although each member of the panel praised the collections for their high quality, young Belgian designer Ann Boogaerts from ArtEZ was happy to receive the award. 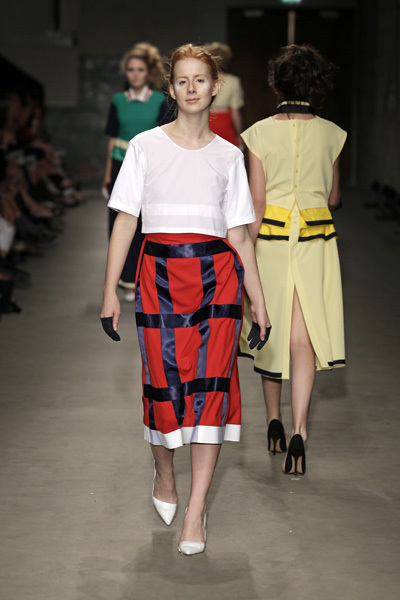 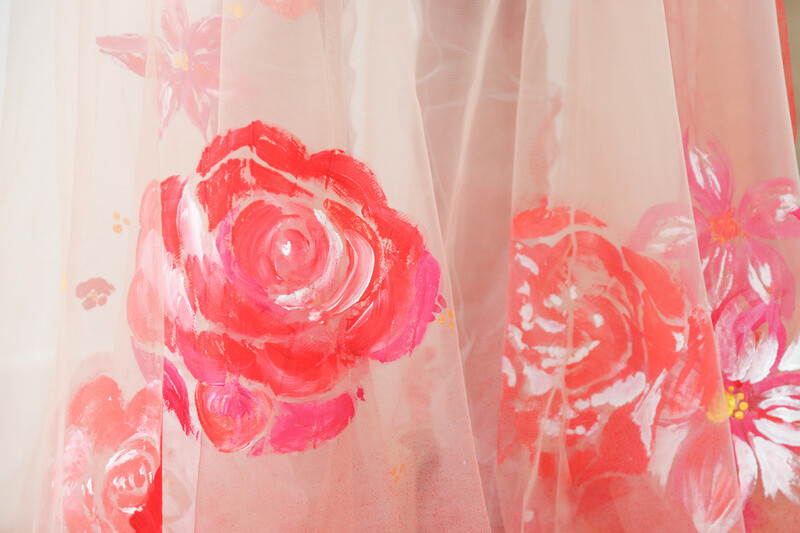 Her collection was inspired by Belgian royalty and Dutch artists like Mondrian. 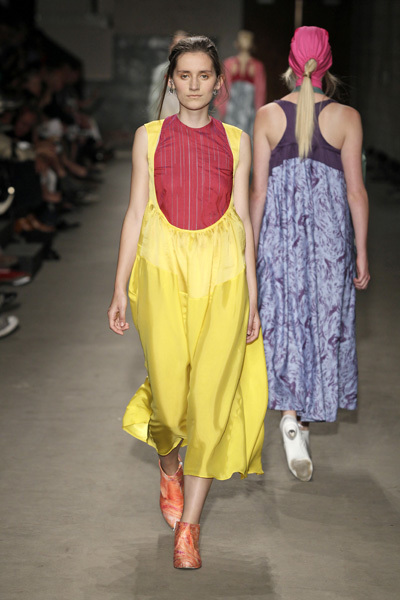 There were beautiful geometrical shaped dresses in bright colors like yellow and red. 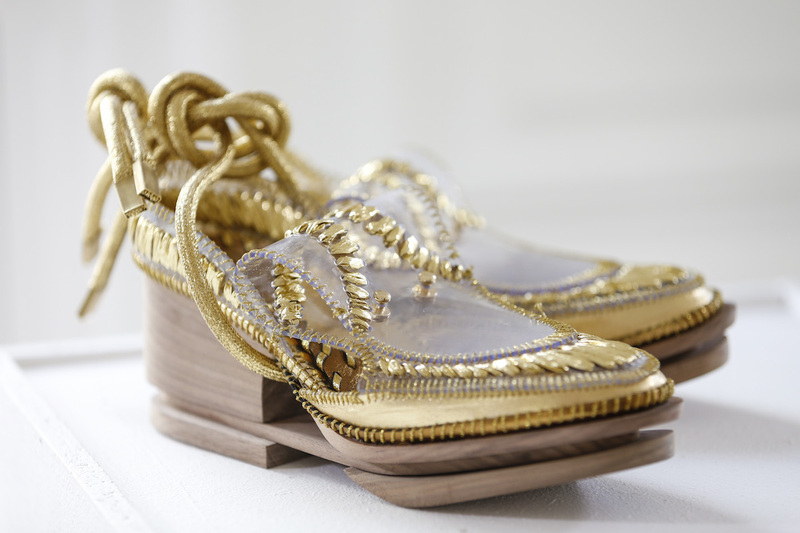 Fine embroidery and stylish hair and shoes made the outfits look royal-worthy. 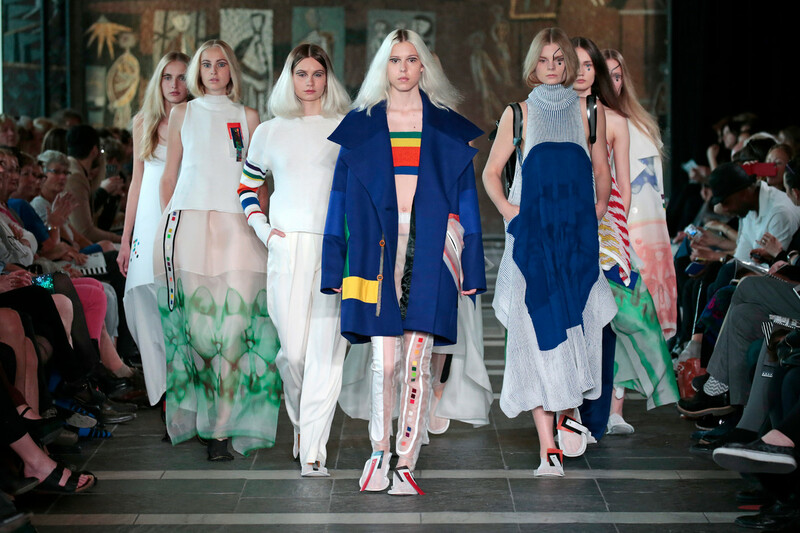 The Dutch national anthem played during the show. 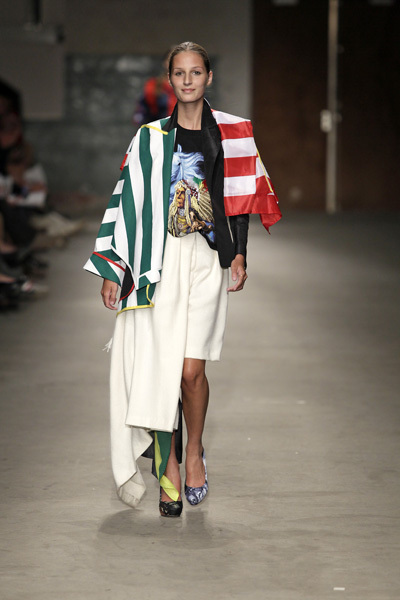 Boogaerts seemed to be proud of her being a young Dutch designer. 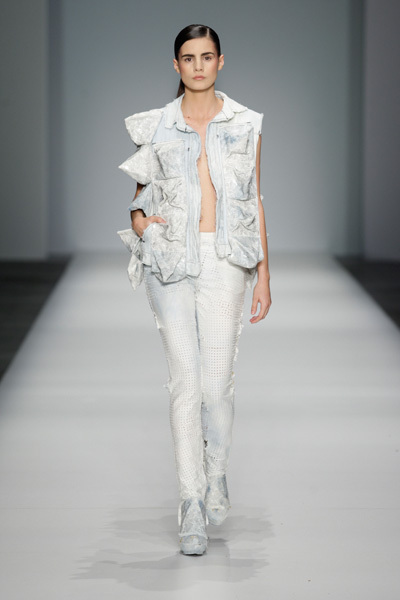 Winner of the G-Star Raw Denim Award Anneloes van Osselaer.